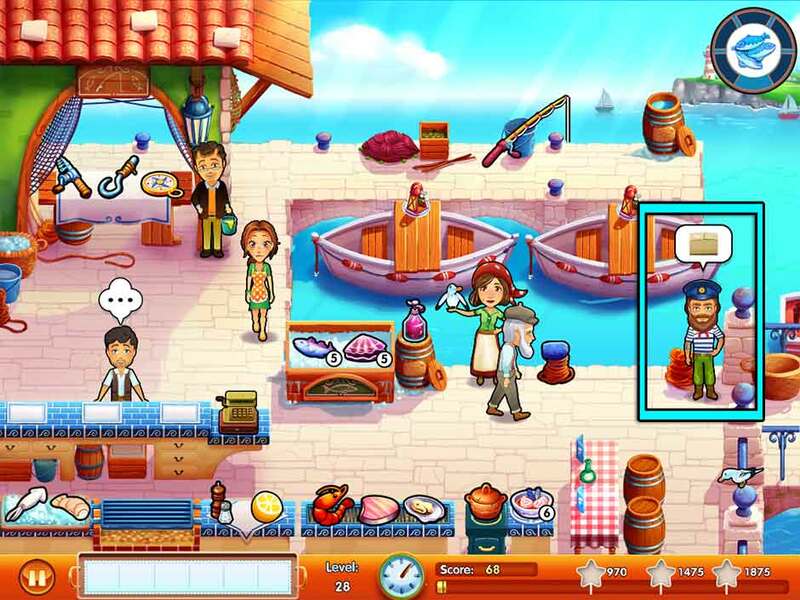 Welcome to the Delicious – Emily’s Message in a Bottle Official Walkthrough! Join Emily on a family adventure that spans 30 years – from the picturesque setting of Napoli, Italy, to her quiet home in Snuggford. It’s almost Paige’s birthday, and little does she and the family know that one small message in a bottle is about to make a big splash! This is the official game walkthrough, covering all levels, challenges, mice locations, photo memories, and trophies! Get started with tips and tricks, or see the game for yourself with our video walkthrough. Click on one of the headers in the table of contents below to get started! Welcome to our general tips and tricks section! There’s plenty to learn in Delicious – Emily’s Message in a Bottle. Get started with tips and tricks and read essential how-to’s to help guide you on your journey. To get started, click “Play”! You will be taken to the level select screen. To navigate between levels, click and hold, moving your cursor left or right to move the level select screen. 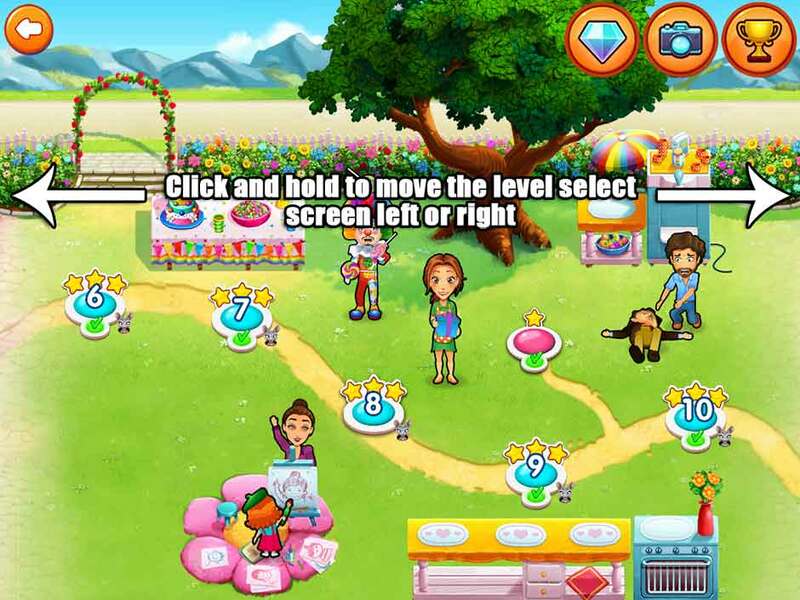 If you’re on a mobile device, tap and hold, moving your finger left or right to scroll the level screen. 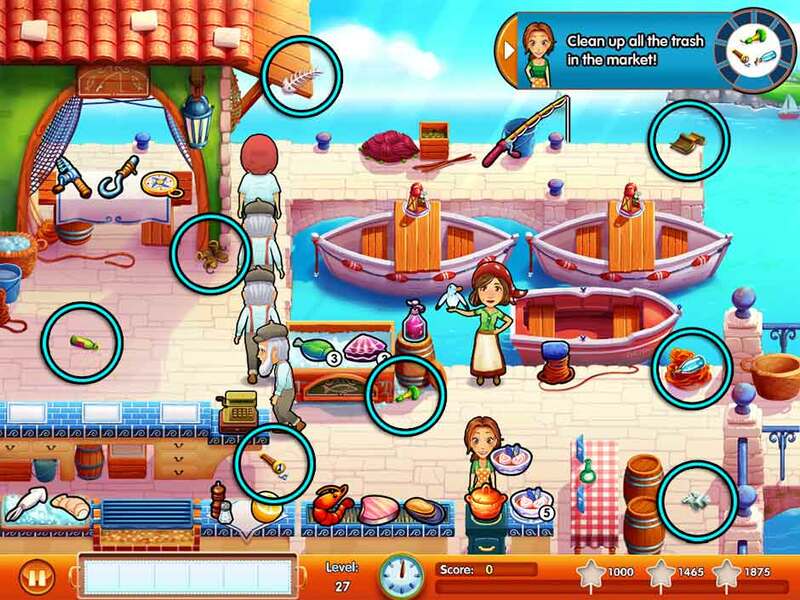 Delicious – Emily’s Message in a Bottle is a time management game. The goal is to serve all the customers that enter your restaurant before the end of the day. The happier the customer, the higher the score! To serve a customer, click on the item(s) that a customer orders to put it on your tray. Your tray is located in the lower left corner of the screen. Bringing the item(s) to the customer in a timely manner will make them happy. When a customer is ready to leave, they will go to the cash register, and a money icon will pop up over their head. Click on the cash register to check them out, adding to your score total. If the customer was sitting at a table, a “!” bubble will indicate it needs to be cleaned once they’ve left. Click on it to clean it so that another customer can sit and dine. It’s that simple! The happier the customer, the higher your score will be. Customer happiness is indicated by the number of hearts that appears over their head. If you serve customers quickly, and/or bring them the correct order, the number of hearts will increase. An ecstatic customer will have 5 hearts, and leaves the highest tip. If all of a customer’s hearts disappear, they will storm out of the restaurant without paying. Keeping customers happy is an essential part of obtaining high scores. 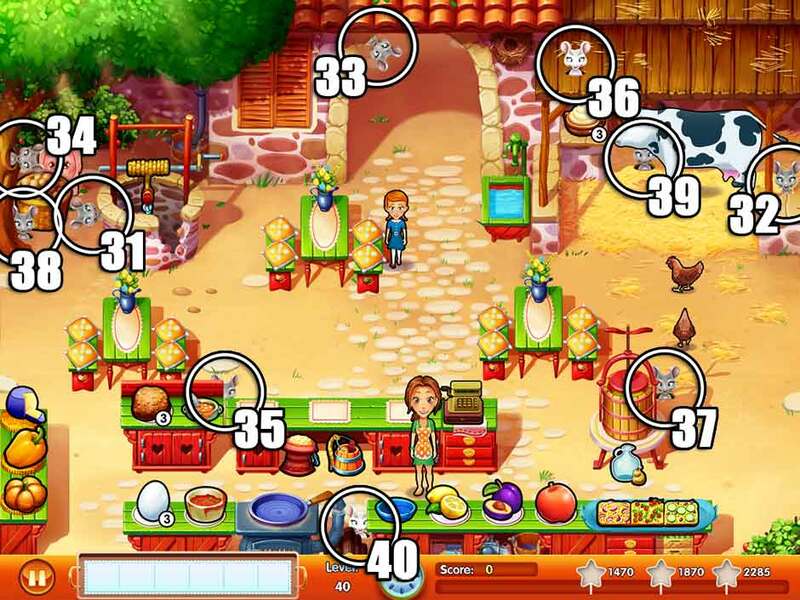 You can earn additional score bonuses by completing daily challenges or objectives, serving customers quickly, serving full orders, serving customers back-to-back, checking out several customers at once at the cash register, and finding mice. You can even unlock menu items and upgrades that will make customers tip more! Throughout each of the game’s 65 levels, a mouse is hidden. Listen for the tell-tale squeak indicating one of the little gray rodents has appeared! Finding a mouse will add a bonus to your score. Find them all to unlock a special trophy! Mice are not hidden in challenge levels, and challenge levels containing mice do not count toward your trophy total. To view a complete list of mice, visit the Mouse Locations section of our walkthrough. You can also click on “Mouse Location” listed per level below to be taken straight to a screenshot of the mouse’s hiding spot! As you play and complete levels, you will earn coins. 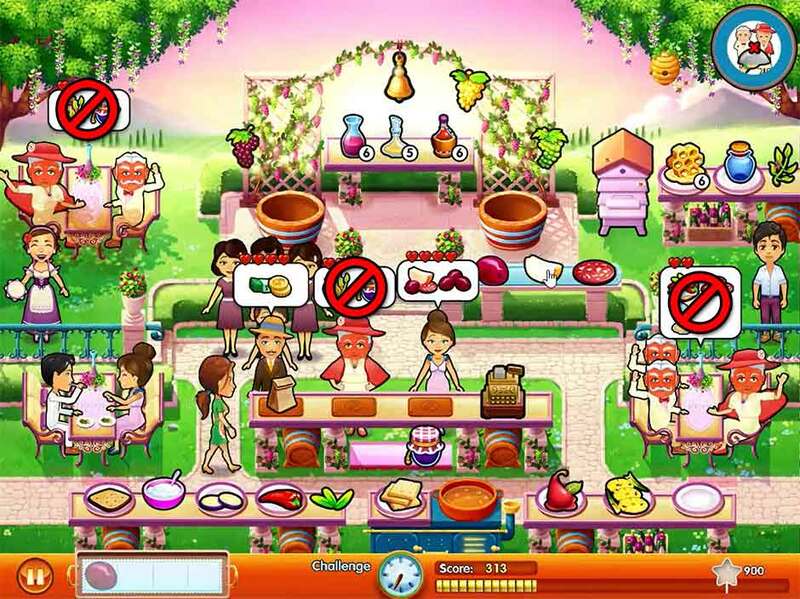 Coins can be used to purchase restaurant upgrades. There are two types of upgrades you can access. Click on the shopping cart icon after selecting a level on the level select screen to get started! Store – Click “Store” to view all available upgrades for your restaurant. The Store specifically features non-menu upgrades. Click on an object with a tag to view the upgrade and how much it costs. You can purchase upgrades to increase customer patience, increase tips, increase speed, and even prevent items from burning or spilling! Menu – Click “Menu” to view all available upgrades for menu items. Click on a menu item to get started. An information bubble will appear, showing all menu options that can be used. As you play, you will unlock additional menu items that increase patience, tips, or both! Tap on a menu item with a lock to view the requirements needed to unlock it. Completing challenges and level objectives will reward you with diamonds. 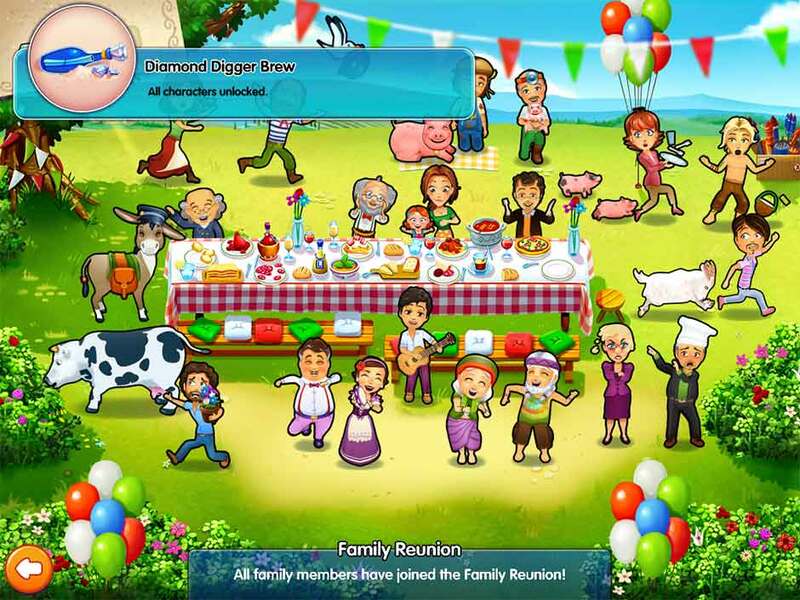 Click on the diamond icon in the upper right corner of the level select screen to view the Family Reunion. Here, you can use diamonds you’ve earned to send invitations to friends and family members. Select a silhouette to unlock a guest. Click on unlocked guests to view the letters sent to them. Complete all challenges and level goals to complete the family reunion! As you play, a number of memorable photo moments will occur. These are special moments Emily likes to document throughout the course of the game. Click on the camera icon in the upper right corner of the level select to view Emily’s photo album of memorable moments. Memorable moments happen during cutscenes, and will be outlined by a sparkling circle. Click on the camera icon when these appear to help document her memories! Stack your tasks! Don’t be afraid to click on multiple items and stack the number of tasks you need to do. Stacking tasks is an excellent way to keep moving quickly and keep customers happy as a result. Restock at the start of the day! The start of the day is an excellent time to restock all items. Items often aren’t fully stocked when you start the day, so give yourself the advantage by restocking right away. Keeping items in stock throughout the day is an important part of keeping preparation times quick and easy. 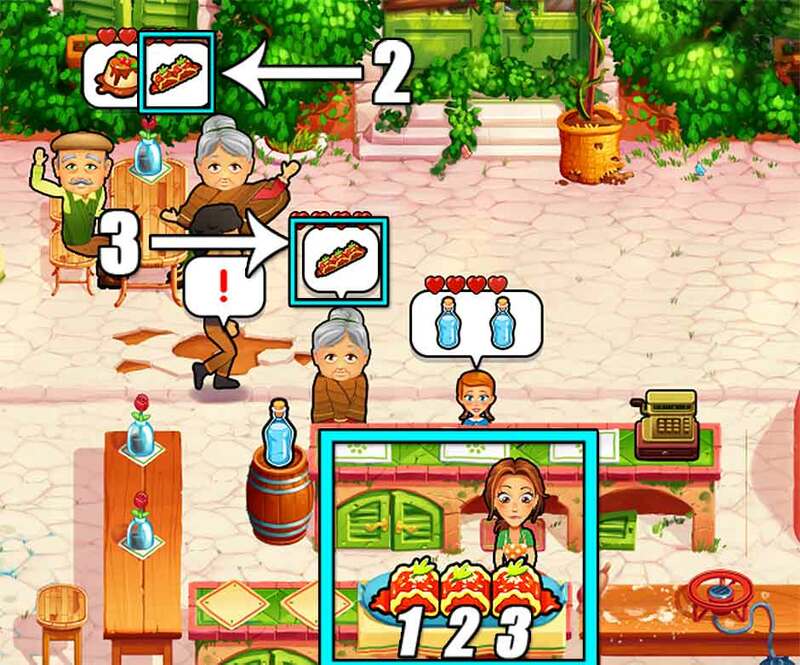 Use the cash register to navigate the restaurant faster! You don’t have to wait tableside while customers are eating. Click on the cash register to quickly navigate back to the preparation area. Check out multiple customers at once! Checking out multiple customers at the same time will give you score bonuses, and is an essential part of obtaining those high 3-star scores. Serve full orders! Try to bring all the items a customer or tables order in one go. Doing so will earn you a nice tip and help your score. Keep those tables clean! When customers are done eating, a “!” bubble will pop up over the table indicating it needs to be cleaned. If you don’t clean tables in a timely manner, customers who come in and go to sit down won’t have anywhere to sit, and may leave as a result. Keep customers happy by using entertainers! Whether customers need a little extra mood boost, or you need a little extra time to prepare their order, using an entertainer is certain to improve a customer’s experience! Only table or sit-down customers can be entertained. Customize your menu! 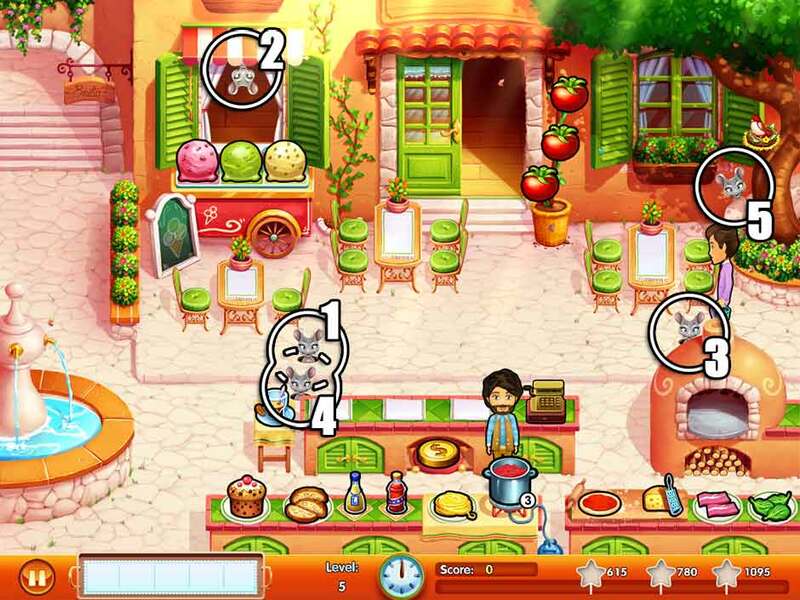 As you play, you will unlock new menu items for your restaurant. Customize your menu to improve customer patience, tips, or both to boost your score! They say if you put a message in a bottle and throw it into the sea, it will always end up where it’s meant to go. Little does Emily know, one small message written 30 years ago is about to make a big splash in the Napoli family! Welcome to the Delicious – Emily’s Message in a Bottle Official Walkthrough! The sights and smells of Italy are warm and welcoming. There’s nothing like a family restaurant. But behind the restaurant’s success lies some growing family tensions. Relive Emily’s early childhood in the picturesque setting of Napoli! Mouse Location: On the cobblestones, just below the right chair of the leftmost table. 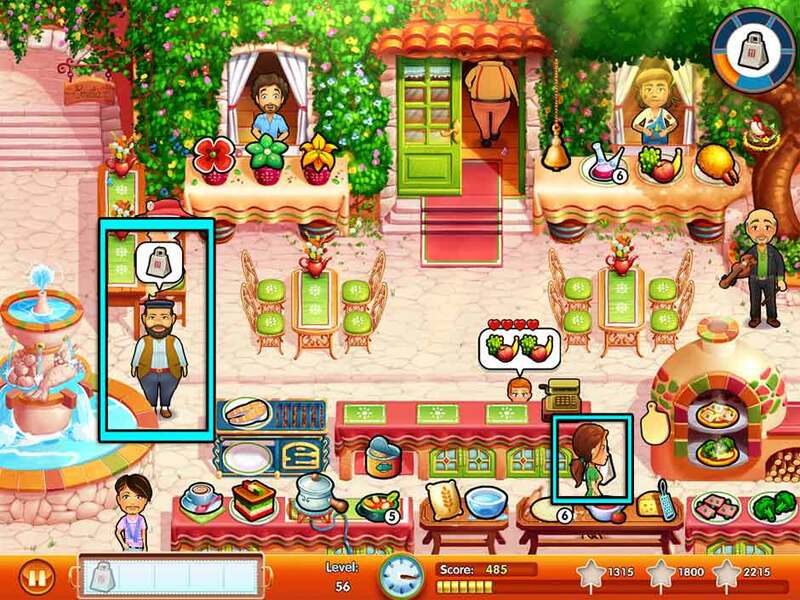 Today’s your first day in the restaurant, so it’s a perfect day to acquaint yourself with how the game works. When a customer is ready to order, a bubble will pop up over their head, showing what they’d like. Click on the corresponding items, then click on the customer(s) to take the item(s) to them. When a customer is ready to pay, they will go to the counter, and a bubble containing money will pop up over their head. Click on the cash register to check them out. All items are very straight-forward, with the exception of the pizza. To make a pizza, click on the dough in the lower right corner, followed by the cheese, and finally the pepperoni. The pizza will go into the oven. When finished, the pizza will blink. Click on the pizza to add it to your tray, then take it to the customer who ordered it. The secret ingredient… what could it be? Mouse Location: Hanging down from the top of the open window on the left. Seven secret ingredients are scattered throughout the area. Find them all before the day ends to complete the day’s objective! Their locations are pictured in the screenshot below. Tip! Pasta will be added to the menu today, and customers can toss coins into the nearby fountain. Click on the pasta, followed by the pot of sauce to make pasta for customers. When a customer goes to the fountain and the coin is shown in the bubble over their head, click on the coin beneath the counter, then click on the customer. A meter will appear. 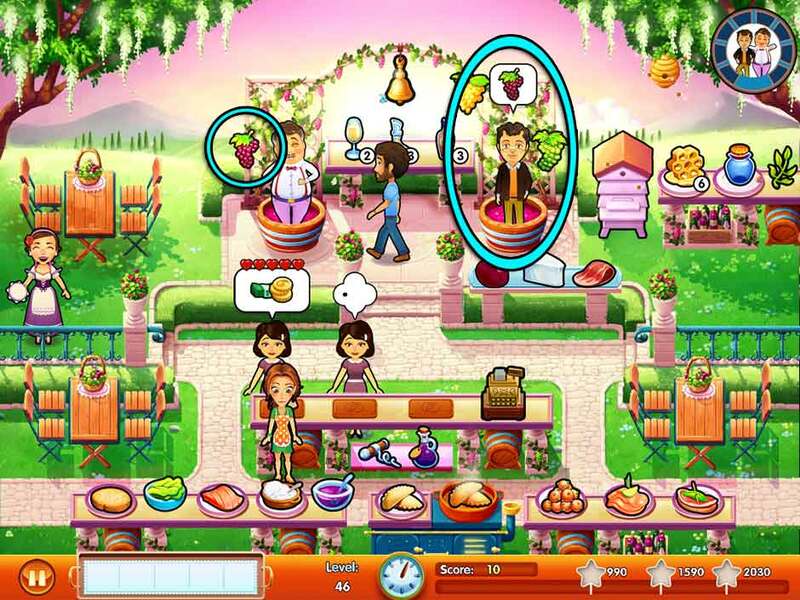 Click on the customer again while the needle is in the green zone to help them flip the coin into the fountain. The brothers will use any trick in the book to discover the ingredient. Mouse Location: Behind the upper left portion of the pizza oven. Tea, ice cream, and a new pizza topping will be added to the menu today. When a customer orders ice cream, click on the scoop of ice cream in the upper left corner 3 times in order to complete a cone. Now that there are two pizza toppings to choose from, it’s best to make pizza to-order. Hold off on making any pizzas until a customer orders one. It’s Emily’s 3rd birthday! What will grandpa’s announcement be? Mouse Location: Behind the upper left portion of the customer counter, near the tea table. Little Emily is busy playing hide-and-seek around the restaurant. Find her 5 times before the end of the day to complete today’s goal. 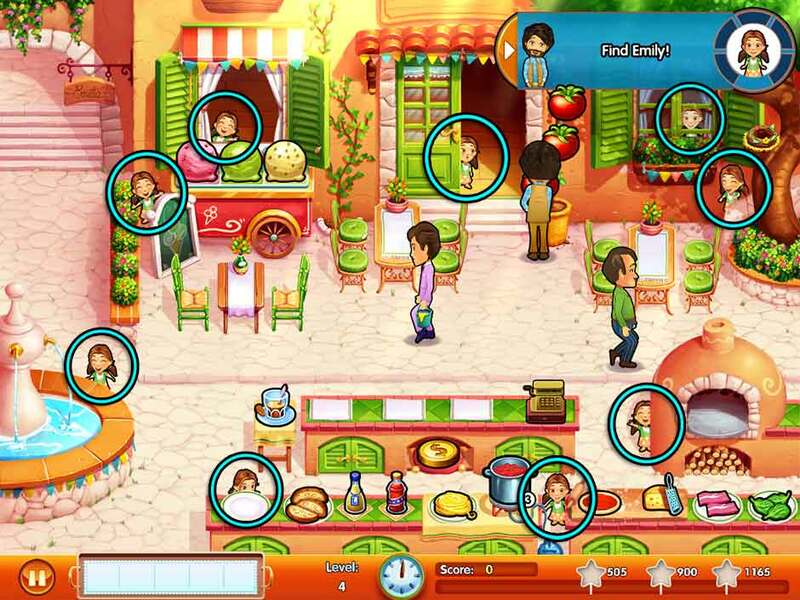 Emily can appear in several locations around the restaurant. Refer to the screenshot below to see where she likes to hide. Listen for her tell-tale giggle, then click on her before she disappears! Tip! Two more flavors of ice cream are available today. Customers will either order a cone with three scoops of the same flavor, or a cone with all three. To make a cone of all three flavors, click on each flavor in order from left to right (pink, green, then white). Mouse Location: Peeking out from behind the rock beneath the tree in the upper right corner of the screen. The restaurant is fully stocked with items today, so it will be busier than the previous few days. If you find yourself having difficulty keeping up, try pre-making pizza. You have five slots on your tray today; try sparing one or two for pre-made pizzas (either pepperoni, spinach, or both!). It’s almost Paige’s birthday! The family’s all here and preparing for the celebration, but little do they know they’re about to receive a very unexpected gift! 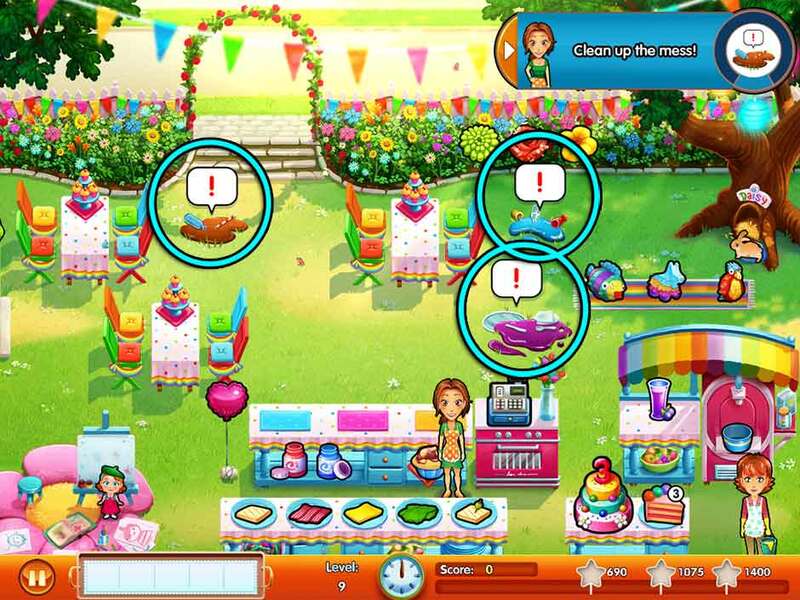 It’s almost Paige’s 3rd birthday – receive the packages to prepare her party! Mouse Location: To the right of the flower vase sitting next to the cash register. Throughout the day, the postman will show up carrying packages. When he shows up, a “!” bubble will appear over his head. Click on the postman to collect the package. You will need to do this 4 times before the end of the day to complete the day’s objective. Tip! Click on the birthday cake to stock up more slices of cake for customers. Additionally, whenever a customer orders a cupcake, click on the cupcake beneath the counter. It will be popped into the oven beneath the cash register. Once finished, the cupcake will blink, indicating the delicious warm dessert is ready to be served! The party had begun! Keep serving the family so they have a great time! Mouse Location: Behind the fence in the upper left corner, to the left of the balloon archway. The party’s in full swing today, and the family’s hungry! At the family table, order bubbles will pop up from time to time. Make the item to-order, then click on the family party table to deliver it. You will need to do this 12 times before the end of the day to complete your objective. Tip! There’s an extra topping available for the burgers today, so pay close attention to customers’ orders to see whether or not they want salad or cheese. Additionally, the piñata is available today! Children who want to take a swing at the piñata will go to the tree on the upper right. Pick up the piñata and hand it to them, then click on them multiple times until they successfully break it. Fiesta time! Filippo has some very important news… if he can remember it! Mouse Location: Behind the top of the covering above the ice cream and smoothie stand. So many new products today! In addition to two new types of piñatas, balloons, and a second jar of paint, the soft serve ice cream machine is up and running today! Click on the soft serve cup at the machine on the lower right to fill it with ice cream. Paige will request paints for her art project from time to time on the lower left. Click on the paint color she wants, located underneath the counter, then click on Paige to take it to her. It’s just like serving any other customer, though Paige can be a little impatient, so try placing priority on the birthday girl! Tip! Consider upgrading the soft serve ice cream machine before the day begins. Not only does it make things easier, but the new machine is spill-proof! Fill a soft serve cup and leave it at the station so it’s ready to go as soon as a customer orders, no wait needed. Clean up the mess Edward made when he heard the astonishing news! Mouse Location: To the left of the tree in the upper right corner. Emily’s Garden is a mess! Click on the areas marked with a “!” bubble to begin cleaning. Once you’ve begun, a meter will appear over the mess showing how far along you are in straightening up the area. Clean all 3 messes before the end of the day to complete today’s objective. Tip! 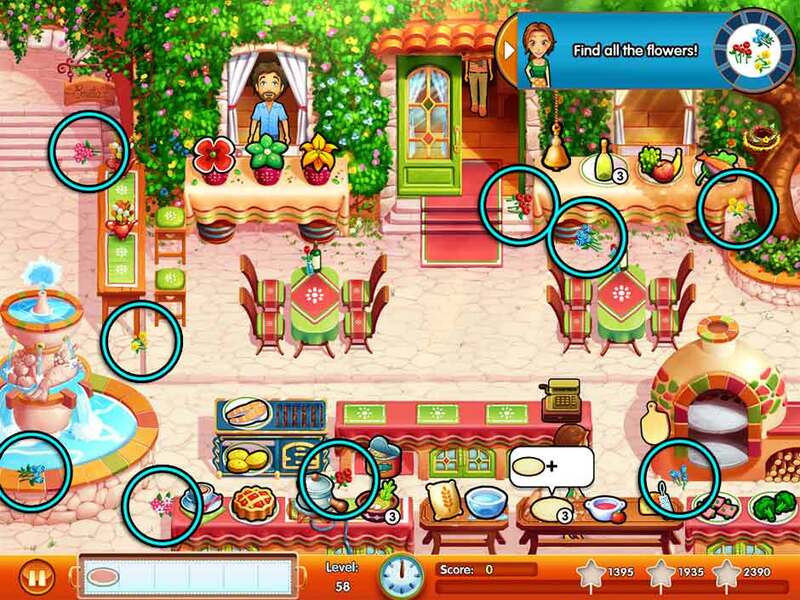 If the restaurant closes, but you’re still not done cleaning, there’s still time to complete your objective! As long as you successfully clean all the messes before the last customer leaves, completing the objective will still be marked as a success. Level 10 – Italy, Here We Come? Help pack the suitcase, as everyone prepares to go to Italy… or not? Mouse Location: In the upper left corner of Paige’s canvas, in the lower left corner below the suitcase. In addition to serving customers, today you will need to focus on packing your suitcase for the trip to Italy. Click on the suitcase located on the left side of the screen to begin packing. A meter will appear showing your progress. Work on packing the suitcase every spare moment you have. Finish packing before the last customer leaves to complete your objective! Tip! Keep your cake stocked and your ice cream full and ready to go to help save time for packing! It may seem like only yesterday, but 30 years is a long time! Emily may have grown and Evelyn aged beautifully, but the family restaurant has certainly seen better days. Level 11 – Italy, Here We Are! What happened to the restaurant over all those years? Let’s work together to fix it up! Mouse Location: In the canvas bag at the foot of the steps in front of the restaurant doors, where the tomato vine is. Mama mia! The restaurant looks a little different than Emily remembers! There are nine areas with “!” bubbles over them which need to be fixed up before the end of the day. Customers will show up throughout the day, but not to worry – there’s no complicated foods to prepare today. Focus on fixing up the restaurant every spare moment you have. Manage your time correctly, and you should be able to easily accomplish most of this before the day reaches the halfway point. Tip! Ravioli is a menu item today. While it may look confusing on first impression, figurati! It’s really quite simple. If a customer orders one, click on the leftmost piece. If a customer orders two, click on the center piece. If a customer orders three, click on the rightmost piece. Refer to the screenshot below for portions. Level 12 – Ti Vogliamo, Napoli! There’s only one thing the family is sure about when it comes to Napoli: they love it! Mouse Location: Below the “Emilia’s” sign in the upper left corner of the screen. Pizzas are back in the oven at the old family restaurant! In order to make a pizza, click on the pizza dough, followed by the sauce, cheese, and finally the pepperoni topping in the lower right corner. The pizza will be thrown into the oven. When it blinks, it’s ready to serve! But be careful – Emily’s not as experienced as Edward when it comes to the old stone oven. Click on the wooden board, or pizza peel, hanging next to the oven, then click on the pizza to move it to your tray for serving. 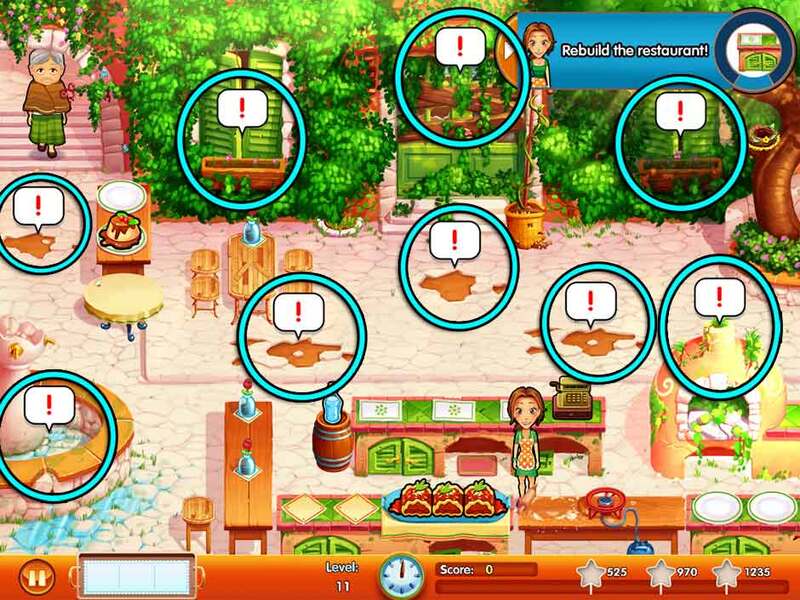 If you click on the pizza without using the peel, Emily will burn her hands! Tip! Click on the tomato vine next to the restaurant doors to refill your sauce pot for the pizzas. Level 13 – The Search Begins! The search for Vittorio is on! Help Emily fix something for them to take with them. Mouse Location: Popping out of the window box full of flowers in front of the left window. A table with ingredients will show up toward the upper right corner of the restaurant today. Pack Paige and Edward a delicious lunch to take with them! Click on the table to begin packing the meal. You will need to stop from time to time to help customers coming into the restaurant. Finish packing the basket before the day is done to complete the objective. Tip! Risotto is on the menu today! Click on the bowl, followed by the topping to the immediate right in order to prepare a bowl. The risotto is located to the left of the stuffed raviolis. Hope, nostalgia, excitement… And a stranger at the docks! Mouse Location: In the lower right corner, in front of the pizza oven. There’s a spinach topping available on pizzas starting today, so pay close attention to customers’ orders! Making a spinach pizza is exactly the same as making a pepperoni pizza. The only difference is after clicking on the cheese, you will need to click on the spinach leaves. Don’t forget to use the pizza peel to remove pizzas from the oven once they’re finished! Tip! Starting today, there are some scaly new residents in the restaurant in the form of fish! These aquatic neighbors live in the fountain and will need feeding from time to time. Listen for the watery “bloop” sound indicating when a fish is hungry. Similarly, if you notice a fish-shaped shadow in the water, it means a hungry fish is about to surface. Click on the fish food can beneath the fountain, followed by the hungry fish to feed it. Be aware that fish have relatively low patience, but at the same time, are perfect for lining up 2- and 3-in-a-row combos with other customers. Mouse Location: In the tree in the upper right corner, next to the bird’s nest. Packages will be arriving throughout the day today. Keep an eye out for the postman, who will show up next to the fountain on the left. When the package icon appears over his head, click on him to collect Patrick’s boxes. Collect all 4 packages before the end of the day to complete the objective. Tip! There’s a new beverage table beneath the dessert table on the upper left today. Click on the red cup to prepare the drink as per customers’ orders. Click on the cup when the needle reaches the green area to collect the perfect beverage. If you find yourself short on time, try preparing one of these and keeping it on your tray, ready to go when a customer orders. The arrival of the brothers was a surprise for everybody – and not exactly in a good way. Mouse Location: Behind the back of the fountain in the lower left corner the screen. Patrick’s lovely flower stand is open for business today. Customers will order bouquets consisting of either one type of flower, or a combination of all three varieties. Flowers work just like the ice cream stand at the old restaurant. Click on the flowers three times (either three of the same variety, or one of each from left to right) to gather a bouquet. Patrick will deliver them directly to you, so you don’t need to worry about Emily going out of her way to collect them before handing them to customers. Time to meet Paige’s ‘other grandpa’. Could this possibly be…? Mouse Location: Behind the top of the singles table, to the right of the fountain in the lower left corner. The pace is picking up in the restaurant today, and pizzas will be especially popular. If you haven’t already, upgrade your pizza oven so that pizzas won’t burn. Doing this will allow you to pre-make pizzas and leave them in the oven for customers, without them taking up a spot on your tray. A good strategy to use if you find yourself struggling is to make one type of pizza and place it on your tray, then prepare the second type and leave it in the oven. Make new pizzas as necessary per order, or replenish your pizzas using the above strategy. You may also want to try preparing beverages early-on for your tray if you find yourself easily backlogged. Memories can be lost, but what about feelings? Keep an eye on Vittorio! Mouse Location: Peeking around the right side of the counter, next to the cash register. 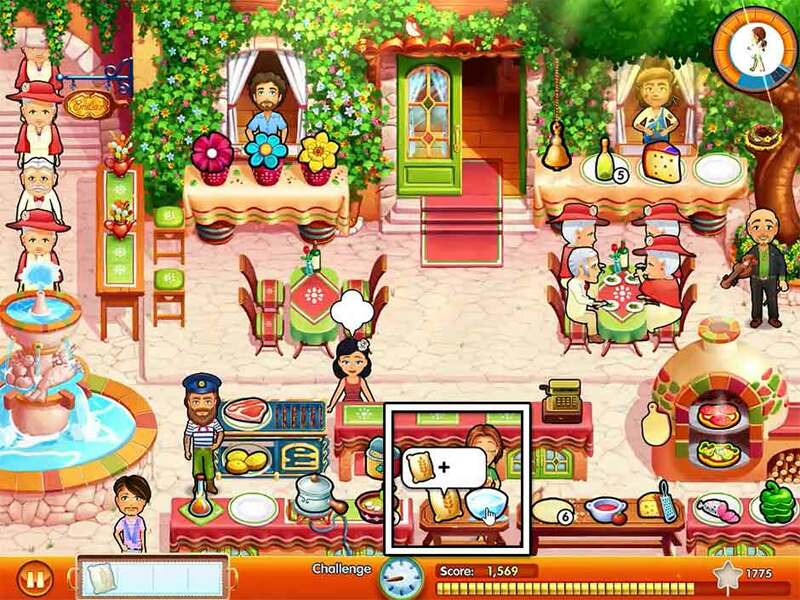 The restaurant is very busy today, and what’s more, you’ll need to keep an eye on Vittorio! Vito is standing on the right side of the restaurant, above the pizza oven. However, Vito will begin to wander away from time to time. He will make his way to the left side of the restaurant before heading out via the archway on the upper left. It’s very important he not wander off! Click on Vito to stop him from wandering away from the restaurant. It’s very easy to lose track of him amidst the bustle of the restaurant, so try to keep customers entertained with Edward’s help. It’s also a good idea to keep one of each type of pizza ready to go on your tray, in addition to an extra in the oven. Upgrades will prove very useful today, including any Menu items which can increase customer patience. 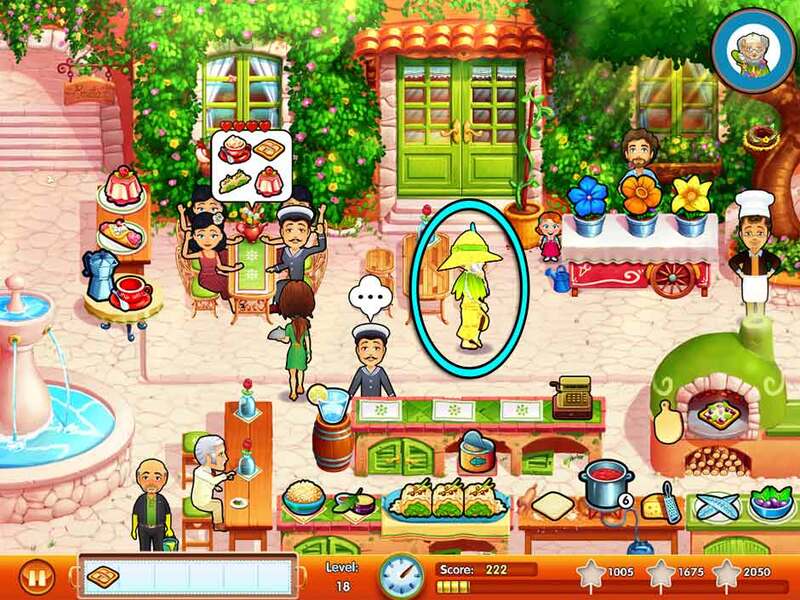 Keep Vito in the restaurant until the end of the day to complete your objective! Level 19 – Remember Me? Mouse Location: Peeking around the upper left side of the pizza oven. The bustle of yesterday’s restaurant continues today, only this time, you don’t have to worry about Vito wandering off! Focus on keeping customers happy. Once again, pizzas will be a popular menu item, so try to keep one of each prepared and ready to go on your tray at all times to prevent customers from having to wait long for their orders. There’s only one way to bring Vito’s memories back! Mouse Location: In the lower portion of the fountain in the lower left corner of the screen. It’s the last day at the old family restaurant. Thankfully, you have a number of helpers on hand to keep things from becoming overwhelming. Utilize the tips outlined in the above levels, keep two pizzas on your tray and one in the oven, and the day should be smooth-sailing. The sea is a cruel mistress, and it takes a certain amount of stubbornness to make a living from her treacherous waters. But crashing waves and howling winds are arguably more welcoming than a stubborn old sea dog like Marco! Edward and Emily arrive with high hopes, but where is Marco? 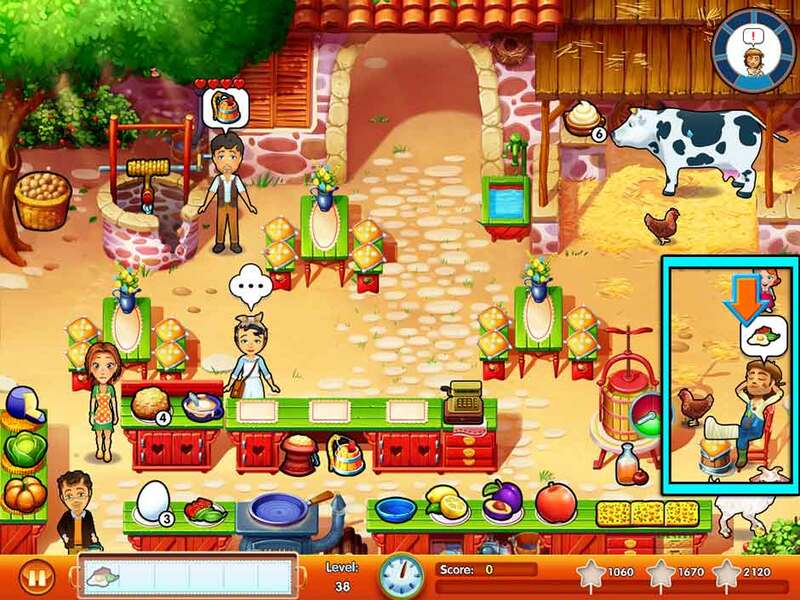 Mouse Location: To the immediate left of the basket on the far right side of the screen, where the customers enter. It’s the first day at Marco’s Fish Market, but Marco is nowhere to be found. It looks like Emily will have to take care of the customers. Being the first day here, things will remain relatively simple. To grill fish, click on the fish in the lower left corner to throw it on the grill. Once the fish blinks, it’s ready to serve! Click on the grilled fish, followed by the nearby salt and pepper to top it off and complete the dish. The nearby crab claws are also grilled, but always ready to serve. When a customer orders these, click on the claw three times to complete the dish for serving. To the right is a soup pot, which you can click on to refill your soup stock easily at any time. Tip! Some customers will hop into the red boat and wish to be cast off. For these customers, click on the item they’d like and bring it to them, then click on the boat tie to release it from the dock. These customers will eventually return to pay for the excursion. Marco comes and goes in a flash, without a thought for what’s in his way. Find every crab! Mouse Location: At the top left corner of the ice chest which holds fish in the middle of the restaurant. Even a sea wolf like Marco has weaknesses and regrets. Mouse Location: Hanging down from the center of the overhang roof in the upper left corner. A third pre-made grill item is available today. Customers can order either three of one type of grill item, or a combination of all three. There is also a new lemon topping available in addition to the standard salt and pepper. Tip! Customers may also order freshly-caught fish today as a new menu item. These are kept on the ice bed near the water, along with a new beverage. The fish stock is limited. If you find yourself running low, click on the fishing pole at the top of the screen to catch more! What better place to talk things out than inside a boat? Prepare lunch for Edward and Marco. Mouse Location: Peeking around the upper left corner of the upper left docked boat. Today you will need to prepare lunch for Edward and Marco. 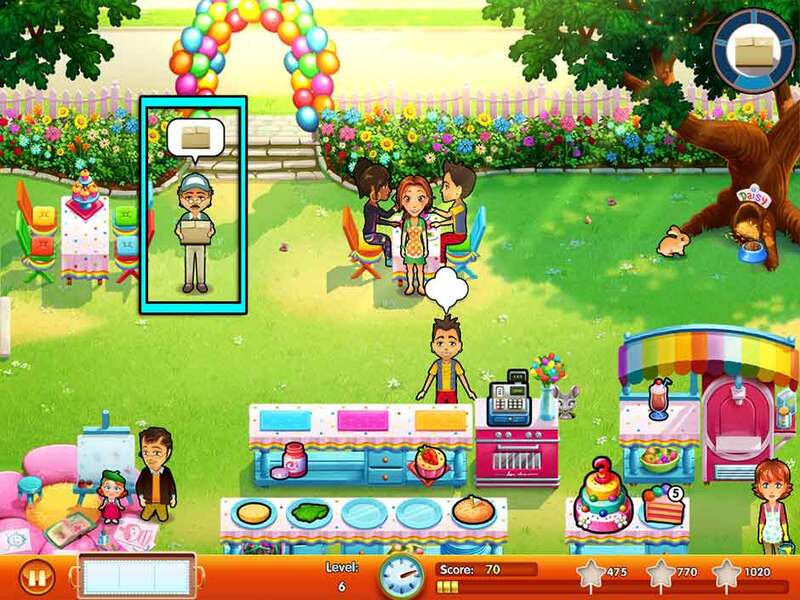 A picnic basket will appear on the right side of the screen. Occasionally, a bubble will pop up over this basket displaying an item. When this happens, prepare the item shown above the basket, then click on the basket to place it inside. Prepare all 8 items shown above the basket before the end of the day to complete the day’s objective. Tip! There’s a second fresh grill option which will appear on the lower left today. Pay close attention to customers’ orders since there’s more options to choose from! The sea is so calm and endless, the brothers won’t have a choice but to open up. Mouse Location: Hanging down from the bottom of the wood portion of roofing in the upper left corner. There’s not much new at the docks today, but since Edward is out with Marco, you won’t have any help cleaning up the tables. Keep this in mind as you serve customers. 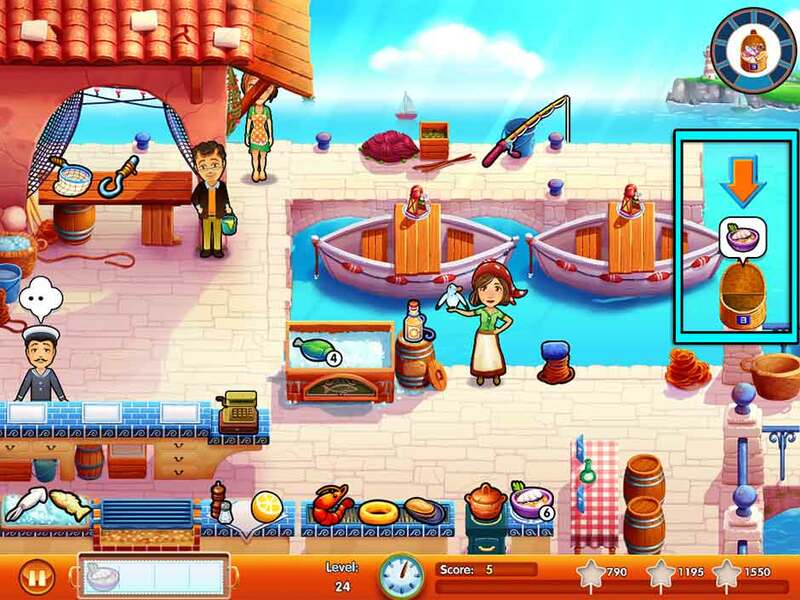 Whenever customers leave a table or boat and a “!” appears, clicking on it will cause Emily herself to go clean the table. Remember to pay extra attention to your counter customers today and use Arabella’s help to keep boat customers happy as needed. Mouse Location: Behind the upper right portion of the grill, between the mussels and the chowder pot. Edward’s still out today, so Emily will need to continue cleaning tables on her own. 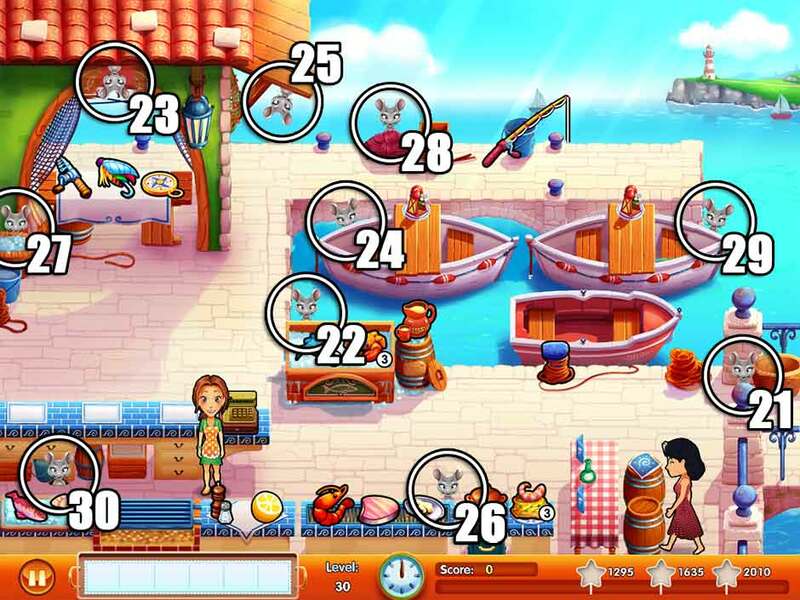 Use Arabella’s help in keeping boat customers happy while Emily juggles the extra tasks. Additionally, clams are available as a freshly-caught option starting today. Much like the fish on ice, these are available in limited quantity. To replenish your stock, click on the fishing rod at the top of the screen. The type of catch you get is randomly split between the fish and clams, so keep fishing as needed if you’re low on stock of either. Mouse Location: Behind the basket of ice in the upper left corner, near the fishing supplies. The market is a mess today! Find all 8 pieces of trash scattered around the area before the end of the day to complete the day’s objective. Their locations are shown below. The sea is full of fish, but not all of them are worth the same. Mouse Location: Behind the red pile of netting at the center top of the screen. Marco’s back from his fishing trip and has several deliveries for you to handle today. Marco will appear on the right side of the restaurant from time to time. When he appears, a package icon will pop up over his head. Click on Marco to collect the package. Collect all 5 deliveries before the end of the day to complete the day’s objective. Additionally, Edward is back to help with tables, allowing you to put more focus on customers today. What if the secret to happiness was easier and closer than we think? Mouse Location: Peeking behind the upper right corner of the rightmost docked boat. The restaurant is in full swing. Today will put your time management skills to the test as you balance grilling food and serving customers. 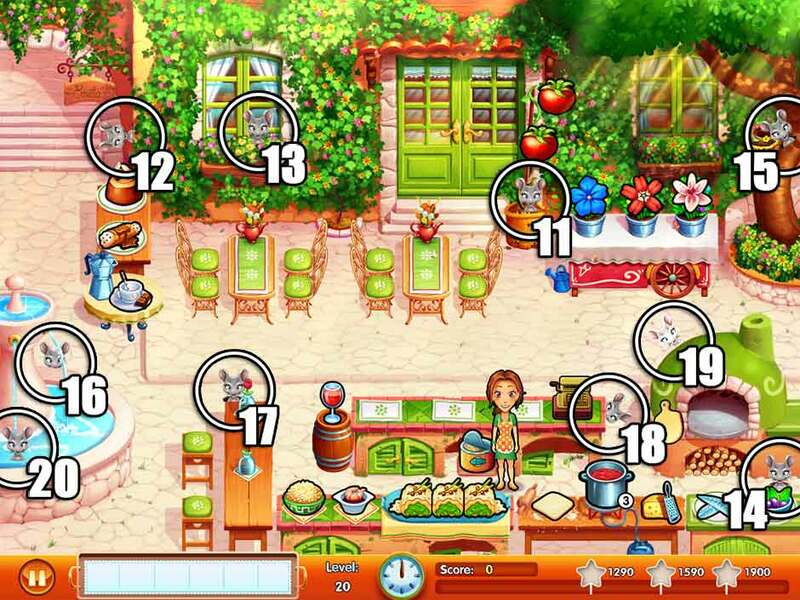 Don’t forget to use Edward and Arabella’s help when it comes to cooking and entertaining. Thank you, Marco and Arabella! Now – time to see what Gino’s been up to! Mouse Location: Between the checkout counter and the ice bed holding the grill items, in the lower left corner of the screen. The market’s busier than ever and the customers keep pouring in. Focus on restocking all your limited-stock items as soon as the day starts, putting special emphasis on the fresh catches brought in via the fishing pole! If you’re feeling confident, you can try preparing grilled items early and keeping them on your tray for future orders. The rest is smooth-sailing with the help of Arabella and Edward. Gino is even less enthusiastic about a family reunion than his mariner brother, Marco. Can you convince him to leave the home-sweet-home feeling of the farm? Mouse Location: Peeking around the left side of the well. 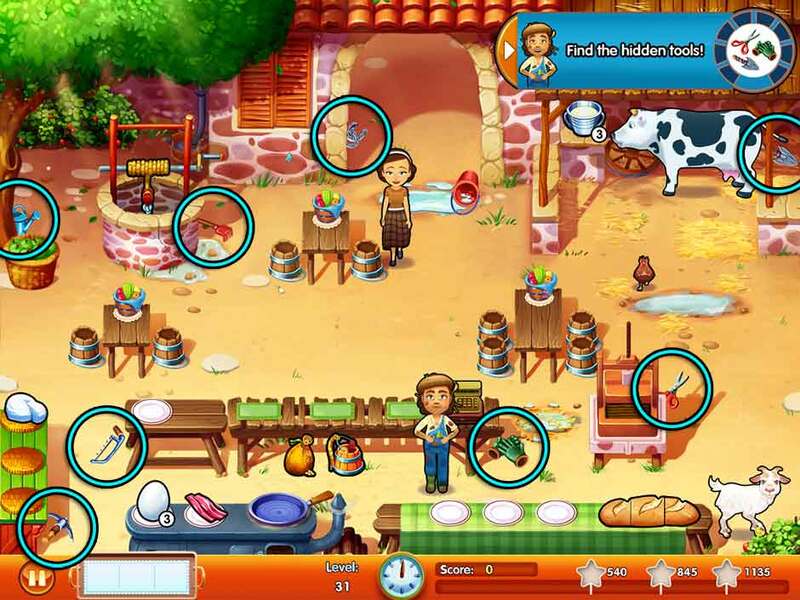 Gino isn’t used to having people around, and as such, the farm is a bit of a mess… Find the 8 tools hidden throughout the area. Locate them all before the end of the day to complete the day’s objective. Their locations are shown below. Omelets are a new menu item. To make an omelet, click on the egg in the lower left corner, followed by the bacon. Both ingredients will go into the nearby skillet. Once they blink, they’re ready to serve! Customers may also ask for a bucket for the well. This is located under the counter. When this happens, click on the bucket, then take it to the customer. Click on them repeatedly until the meter that appears is full to help them retrieve water. Once finished, they will happily make their way to the checkout counter. Tip! Struggling with bread portions? It’s just like the stuffed ravioli. Click on the leftmost piece to gather a single portion, the middle piece for a double, and the rightmost slice for a full portion. Tip! The chickens wandering on the right will lay eggs from time to time. Click on eggs once they’re laid to add them to the stock of eggs for omelets. Similarly, click on the cow on the upper right to restock pails of milk. It’s hard to believe, but in Gino’s farm even animals are more polite than people. Mouse Location: To the right of the cow in the upper right corner of the screen. Fresh onions are a new menu item today, as are bowls of fruit. Serving onions requires no extra preparation, but if you want to prepare a fruit bowl, you’ll need to follow a simple series of steps. Click on the blue bowl at the bottom of the screen, followed by the orange, the strawberry, and finally the pear to top it off. Now it’s ready to serve! Gino’s finally letting Emily help out at the farm. Let’s do some cleaning up! Mouse Location: In the upper left corner of the entrance archway at the top of the screen. The restaurant is still a mess, as marked by “!” bubbles throughout the area. Click on these areas to begin cleaning. A meter will appear showing your progress. Finish cleaning all areas before the end of the day to complete the day’s objective. If you’re running low on time, focus on cleaning before the last customer leaves, and you’ll still be able to achieve your goal. Tip! Truffles are a new menu item today. To serve truffles, click on the truffle on the left side of the counter, followed by the dip. 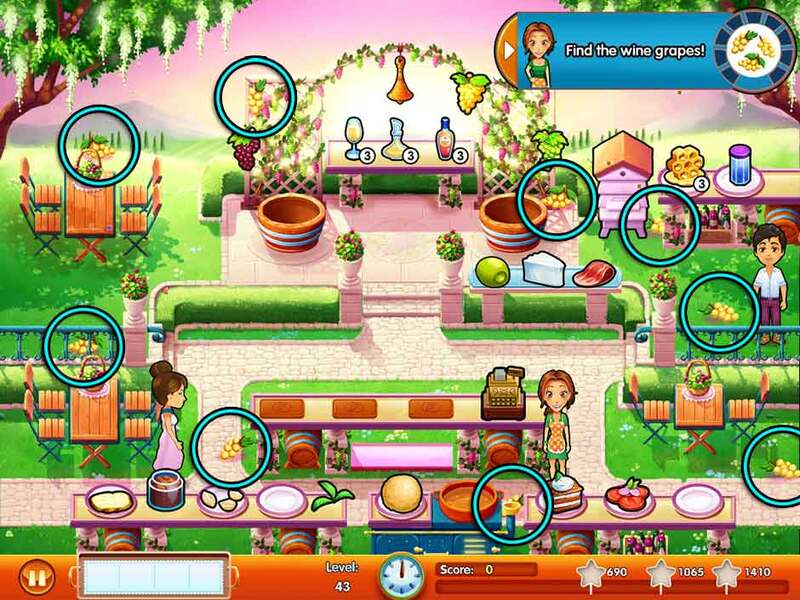 You may notice there’s a number on the truffles – as well as a certain pig named Truffles strolling around the upper left corner next to the well. Truffles, true to her name, will dig up truffles from time to time. When these appear, click on them to add them to the stock ready for serving. Mouse Location: Peeking out of the hole in the tree in the upper left corner of the screen. The apple cider press is ready to serve today. Located to the right of the checkout register, click on the bottle beneath the press to fill it with apple cider. A meter will appear as it fills. Once the needle has reached the green, click on the bottle to stop the filling process before it overflows. Tip! There are a number of useful upgrades to help you around the farm! Upgrade the chickens to double the number for double the eggs, or recruit little Paige to collect eggs for you when you click them. Truffles can even be upgraded to find truffles even faster. It’s also highly recommended you upgrade the cider press so that you never have to worry about a bottle overflowing! Click on a bottle to fill it, and the press will do the rest itself, leaving you with cider ready-to-go, without taking up a slot on your serving tray. Mouse Location: Behind the upper right corner of the truffle counter, to the left of the customer checkout counter. The restaurant is fully stocked today. If you haven’t already focused on upgrades, today is an excellent day to upgrade various aspects of the farm to better serve your customers. Level 36 – Someone Call a Vet! Gino, hang in there just a little longer! Help Edward rescue him! Mouse Location: On top of the wood overhang above the stable in the upper right corner of the screen, above the milk pail. Gino’s in trouble! Click on Edward to have him work on helping Gino out of the well. You will need to click on Edward repeatedly in order to fill the meter that appears. Do this as quickly as possible, every spare moment you can between serving customers. Edward’s tasks are separate from Emily, so if Emily is busy walking someplace or serving customers, you can use this window of time to click on Edward repeatedly as you help Gino up out of the well. Even mean and unfriendly farmers like being taken care of from time to time. Mouse Location: Behind the upper right corner of the cider churn. Gino is safe, though his leg is broken. Things are nearly back to normal service-wise today, with Edward on hand to help clean tables. Focus on keeping items in stock by milking the cow, collecting eggs from chickens, collecting truffles from Truffles, and filling cider so it’s ready to go for orders. Is there a way to make Gino realize there’s nothing like having the family around? Mouse Location: At the foot of the tree in the upper left corner, in front of the truffle basket. 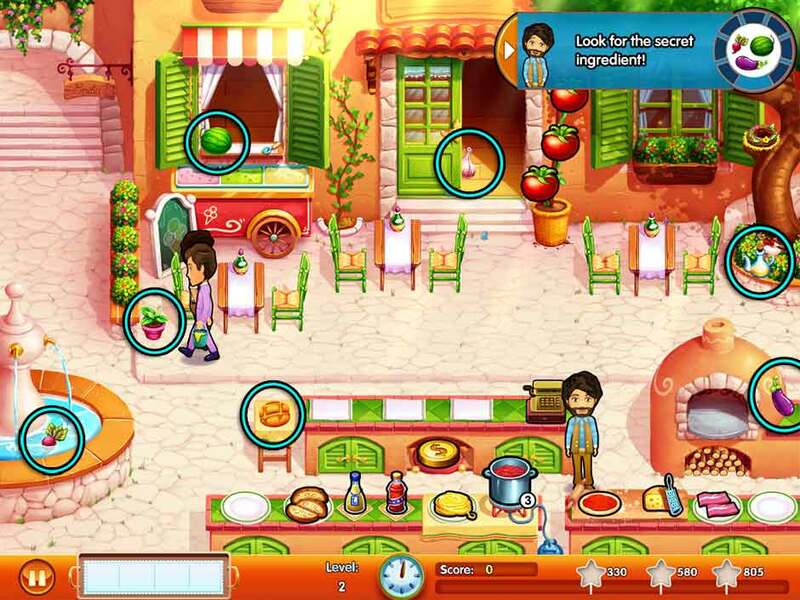 Gino will ask for different items throughout the day – 6 in total. A bubble displaying an item will pop up over Gino’s head from time to time. When this happens, prepare the item he asks for, then bring it to him. Do this successfully 6 times before the end of the day to complete the day’s objective. Tip! Truffles doesn’t appear to be on the farm today, so click on the basket beneath the tree in the upper left corner to restock truffles as needed. Who said you can’t grow fond of pigs? Take care of Truffles so she can recover! Mouse Location: Beneath the cow’s head, in the upper right corner of the screen. Truffles isn’t doing very well, and requires near-constant care. A meter over Truffles will display how much time you have remaining before you need to check on her again. Clicking on Truffles counts as checking on her, and Emily does not have to move over to Truffles in order to do this. As such, click on Truffles between every single task you do to make sure you don’t lose track of caring for her. 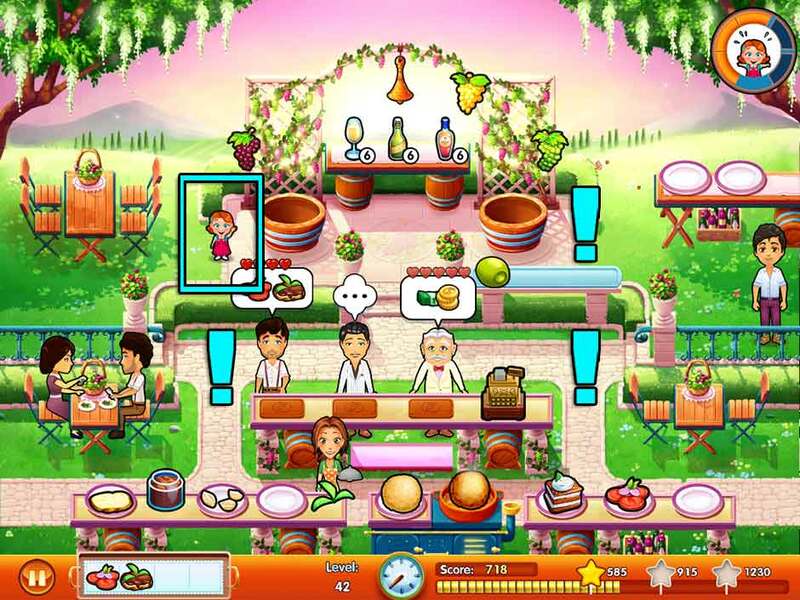 Example: Make cider, click on Truffles, restock milk, click on Truffles, prepare eggs, click on Truffles, serve eggs to customer, click on Truffles, etc. Complete the day without the bar above Truffles depleting completely to achieve your objective. Nothing left to do but hope for the best now… Will Truffles survive the night? Mouse Location: At the bottom of the screen, between the stove and the fruit bowl. It’s your last day on the farm, and all’s well that ends well. Utilize the tips and tricks outlined in the levels above to complete the day without issue. Remember to keep your items in stock! Unlike the other brothers, Vinicio’s restaurant is far from quaint. Rolling hills, fine grapes, and romantic sunsets await! Level 41 – Welcome to the Vineyard! After the mud and fleas at the farm, there’s nothing as refreshing as the vineyards. Mouse Location: Below the checkout counter, on top of the blanket. Welcome to the vineyard! The crème de la crème dine here, and with a few simple tricks, you’ll be a top-caliber server in no time. To start the day off, click on the batter ball above the bottom center of the screen to cook it. Click on the bell at the top center of the screen to restock your wines. When customers ask for appetizers, click on the bread in the lower left corner, followed by the chocolate, and finally the topping. Some customers may want to try making wine themselves. These customers will hop into the barrels at the top of the screen and ask for a specific variety of grapes. Bring the grapes to them and they’ll handle the rest. And just like that, you’re well on your way! Tip! Emily does not have to go to the bell at the top of the screen to ring it and restock wine, so do this whenever and however often you like! Mouse Location: Behind the right side of the olive and cheese counter, toward the upper right corner of the screen. In addition to managing the vineyard register, you’ll need to look after Paige today. Paige will appear from time to time with a playful giggle. When this happens, click on her to have Emily tend to her. You will need to do this successfully 5 times before the end of the day to complete the day’s objective. Paige tends to show up in the four plaza corners. Refer to the screenshot below for these locations. Tip! Clicking on Paige will cause Emily to drop or delay all other tasks she’s currently got lined up. Keep this in mind as she rushes off to tend to her little one. Will Vinicio Jr. take over the vineyard? For now, let’s help him find some grapes! Mouse Location: On top of the railing on the left, in front of Bianca the entertainer. Find the white wine grapes scattered throughout the vineyard. Locate all 9 clusters of grapes before the end of the day in order to complete your objective. Their locations are shown in the screenshot below. Tip! Honey is available in the vineyard today. To serve honey to customers, click on the honeycomb, followed by the container to the right. Click on the bee hive box to restock honeycombs. Wealth doesn’t come for free… does it? Mouse Location: Behind the right side of the snack counter, above the last plate on the right in the lower right corner of the screen. There’s a full range of toppings available for appetizers today on the lower left counter. Pay close attention to customers’ orders, as they may like few, many, or any combination of toppings! Remember to cook the batter ball and restock the wine as soon as the day begins, and keep these items stocked throughout the day. Can you tell the difference between a good wine and a bad one? Mouse Location: Below the rightmost central column holding the pot of flowers, to the lower left of the olives. A wider variety of menu items graces the vineyard today, but the bulk of today’s challenge lies in the multi-layer appetizers on the lower left. Pay close attention to these orders and the layers a customer wants. Remember to keep the wine, honey, and batter balls in stock and ready to serve. Help the brothers make good wine again, the old fashioned way… Will it make up for years of neglect? Mouse Location: At the top of the beehive box in the upper right corner of the screen. Edward and Vinicio are having quite a good time stomping grapes today. From time to time, they will ask for additional grape clusters. When this happens, click on the corresponding cluster of grapes, then take it to them. Fulfill these requests a total of 8 times throughout the day to complete the day’s objective. Evelyn and Edward feel at home in Napoli. It will be hard to leave… but do they have to? Mouse Location: In the bottom left corner, to the left of the sandwich counter. The vineyard is fully stocked today, and it’s important to keep it that way. Keep items stocked throughout the day as you serve customers. There are no special objectives, but you will need to clean any tables on your own without help. Click on tables marked with “!” to have Emily clean them. Bianca is here to keep customers entertained, so use her talents as necessary to keep them happy while you focus on cleaning tables and serving customers. Each generation is nothing but a reflection of what came before. Mouse Location: Hanging down from the branch in the upper left corner of the screen. Today is almost a mirror image of the previous day. 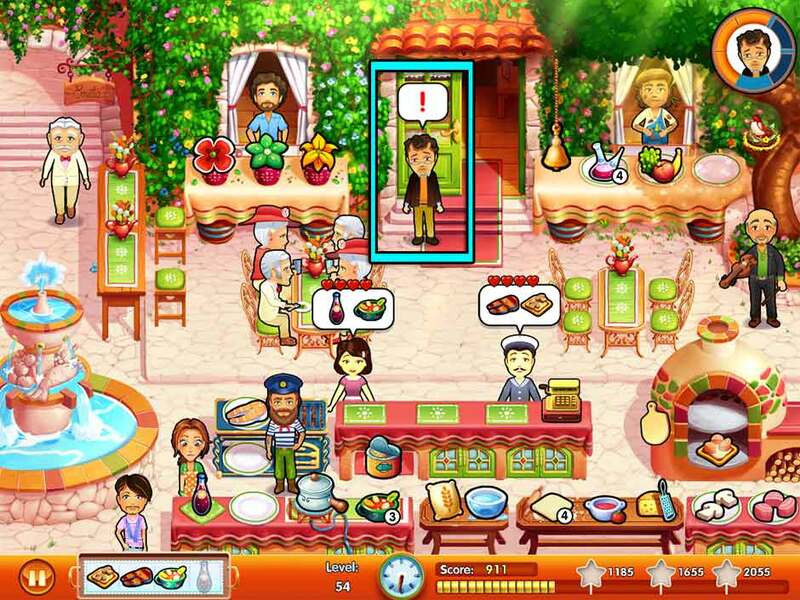 Keep the restaurant running while Edward talks with Vinicio Jr. Will he follow his heart? Level 49 – Back In Business! There’s only one thing worse than a restaurant with too few customers… one with too many! Mouse Location: Above the flowers on the leftmost center column, below the wine table. Deliver quality wine to the customers today! Occasionally, a single customer will wander to the upper left corner of the screen, standing next to the leftmost wine barrel, and request a quality sample of wine. When this happens, click on the wine sample beneath the wine table at the top of the screen, then click on the customer to take it to them. Fulfill 5 of these requests before the end of the day to complete your objective. Just as grapes take time to become good wine, family needs attention to prosper. Mouse Location: Between the rightmost rails on the right side of the screen. The Napoli family wine reputation has been restored, and customers are pouring in. Utilizing the tips from previous levels and upgrades you’ve purchased throughout, keep items stocked and customers happy. Bianca isn’t around to entertain, and Emily will have to clean tables herself, so your time management skills will be put to the test in this final day at the vineyard. Edward is preparing something special, but Evelyn doesn’t like the looks of it. Mouse Location: Below the left side of the flower table, in front of the barrel. Back to the Family Restaurant, only this time, there’s a few changes awaiting you! Patrick will be nearby to man the flower stand as soon as the day begins. There is also a pot of soup at the bottom of the screen, which you can restock at any time by clicking on the cooking pot. Furthermore, the pizza oven has been expanded so that you can cook not just one, but two pizzas at a time. Don’t forget to use the pizza peel when removing pizzas from the oven so that Emily doesn’t burn her hands! To make additional pizza dough, click on the bag of flour, followed by the bowl of water. Level 52 – More Arrivals! A father meeting his sons for the first time in decades… And a pig invasion in-between! Mouse Location: Underneath the leftmost table legs, next to the fountain on the left. Find the 6 piglets hiding around the restaurant before the end of the day. Listen for the oinks indicating they’ve appeared. Their locations are shown in the screenshot below. 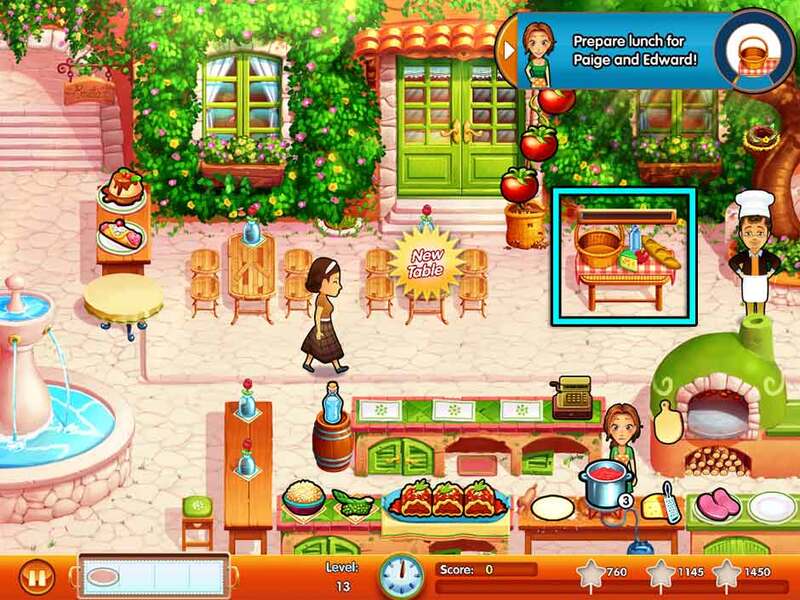 Edward will be behind the counter to help make pizza dough, so Emily can focus on finding the mischievous piglets. Some catching up for the brothers, and some bad news for Edward. Mouse Location: Hanging down from the archway in the upper left corner of the screen, next to the “Emilia’s” sign. 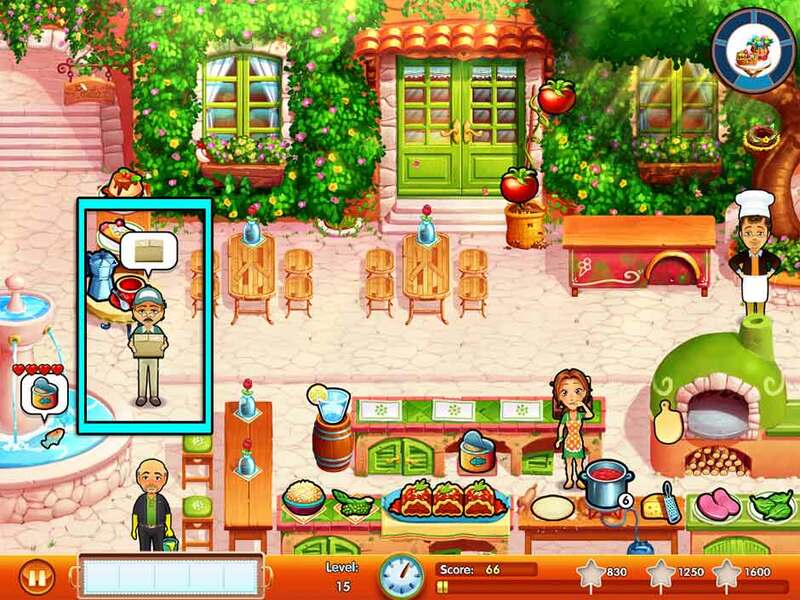 The restaurant has plenty of helping hands, with Edward handling the pizzas, Marco manning the grill, and Gino setting up a fruit and wine stand in the upper right corner. Click on the bell near Gino’s table to restock the wines. Today’s challenge will be learning to manage multiple characters. Clicking on any character other than Emily will allow you to operate that character’s station, completely separate of Emily’s tasks. It’s an excellent day to learn to manage multiple facets of the restaurant without additional challenges. Tip! Upgrade the pizza oven so that pizzas don’t burn! This way, you can cook one of each type of pizza and leave it in the oven, so they’re ready as soon as customers order, without taking up a spot on your tray! Everybody makes mistakes. Try to cheer Edward up! Mouse Location: On top of the left side of the pizza oven. Today’s not going so well for Edward. The poor guy will sulk in front of the restaurant doors. From time to time, a “!” bubble will pop up over his head. When this happens, click on him to have Emily comfort him. Comfort him a total of 5 times before the end of the day to complete your objective. Tip! Since Edward’s depressed, Emily will have to make pizza dough on her own today. Be aware that clicking on Edward will cause any and all actions Emily currently has lined up to cancel. So if you clicked on a customer to serve them, but clicked on Edward before they’re served, Emily will go to Edward and effectively “forget” to serve the customer, prompting you to click on them again. Additionally, customers’ hearts will continue to deplete while comforting Edward, so make sure you finish all your tasks before going to comfort him. Mouse Location: Behind the top of the fish grill. Edward is gone, and traffic has picked up in the restaurant. Keep items stocked and pizzas cooked in the oven ready to go today. It’s a great day to practice your time management, especially with pizza orders. Once again, if you haven’t upgraded your oven already, it’s an excellent idea. Edward finds the solution to his torments right in the middle of the ocean! Mouse Location: Hanging down from the left window where Patrick is standing. Give food to the sailors searching for Edward! Sailors will appear on the left side of the restaurant throughout the day, asking for sack lunches. When this happens, click on the sack lunch next to the cash register to pick it up, then take it to the sailors. You will need to do this 5 times before the end of the day in order to complete your objective. Tip! Marco has joined the ranks of sailors out searching for Edward, so in addition to making pizza dough, you will have to manage the seafood grill on your own today, too. Someone’s back, but the problems are far from over… Did Evelyn really leave Napoli? Mouse Location: Hanging down from the tree branch in the upper right corner of the screen, above the bird’s nest. Edward is back, the restaurant is fully stocked, and all hands are on deck! Focus your time management skills into keeping items stocked and pizzas ready to go for hungry customers. Tip! Customers will order a lot of grilled potatoes today. Consider cooking some early and keeping them on your tray to save time. Can Edward have one last chance? Help clean the flowers so he can do what’s important! Mouse Location: In the glass window of the restaurant door – the left center pane specifically. Find all the flowers scattered throughout the restaurant. There are 9 little clusters to be found around the Family Restaurant. Their locations are shown below. Locate them all before the end of the day to complete the day’s objective. Tip! There’s a second menu item at the seafood grill today. Consider keeping one cooked seafood item on your tray in order to reduce preparation time for orders. The family reunion is almost here… Will the secret ingredient finally be revealed? Mouse Location: In the lower left corner, below Marco and near the fountain. Customer traffic is picking up, and with it, customer patience is decreasing. Using your fine-tuned time management skills and the tips outlined above, serve all the customers while keeping items stocked, and without burning Emily’s hands! Today’s the day! Help Emily prepare all the food for the reunion – everyone’s counting on her! Mouse Location: Just below the “Emilia’s” sign in the upper left corner. 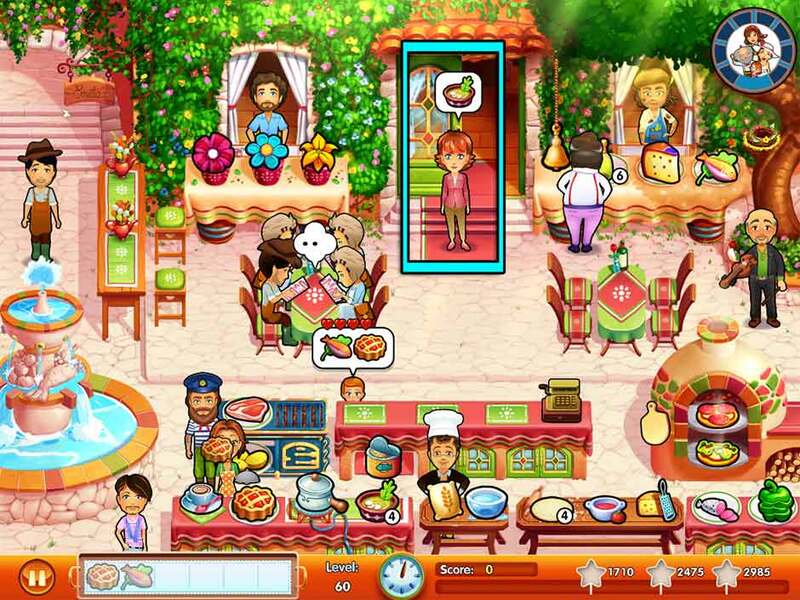 In addition to running the restaurant, prepare the food for the family reunion! Family members will come out of the Family Restaurant throughout the day, asking for specific menu items. When this happens, prepare the item requested, then take it to the family member. You will need to do this 8 times before the end of the day in order to complete your objective. Thirty years ago, Vittorio sailed far away from his family problems. But you can’t hide from your problems forever, as Vito is soon to find out! The 30th anniversary of a certain someone’s arrival on the island draws near! Mouse Location: At the top left side of the pile of boulders in the upper right corner of the screen. Hippie Island introduces a new kind of challenge. Vittorio moves slower than Emily, so your precision will need to be impeccable in order to keep the carefree customers happy. Make sandwiches via the table at the bottom of the screen. Customers may request different toppings, so pay close attention! There is also a spit grill on the right. Items will burn if you leave them too long once cooked, so be careful! You can refill drinks on the left, or restock seashells via the pile on the left. 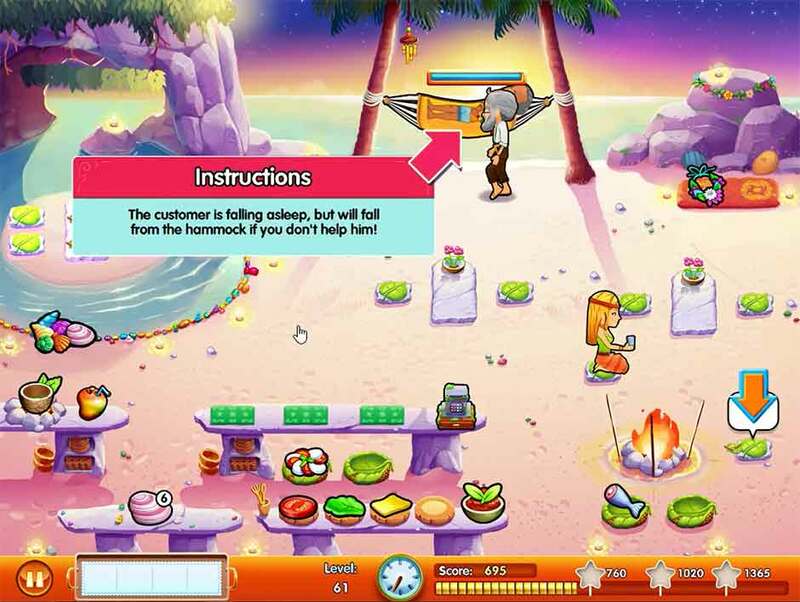 If a customer wishes to sit in a hammock, they will move to the trees at the top of the screen. Click on the hammock to set it up for them. A meter will appear. It’s very important you click on the hammock again before the meter reaches the halfway point, or else the customer may fall out! One way or another, Parsley always manages to be in the wrong place, at the wrong time. Mouse Location: In the grove in the upper left corner of the screen, below the string of lights and to the right of the candle on the rock. There’s more sandwich toppings available today. You will also have the option to upgrade to the ukulele. It’s highly recommended you purchase this upgrade right away. Customers who use the ukulele will bolster the mood of all other customers, increasing the numbers of hearts and tips! 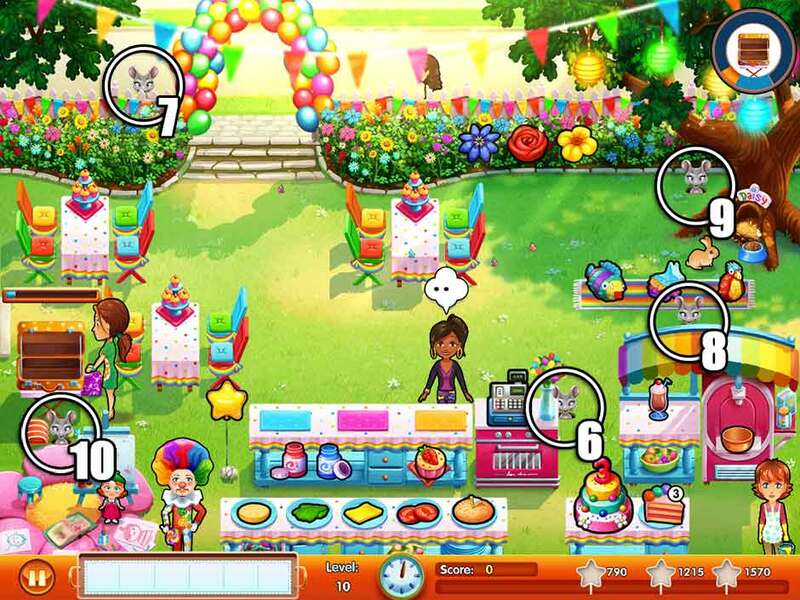 Level 63 – Get The Party Started! Vittorio’s 30th anniversary party is so ‘far out’! Mouse Location: Behind the pile of seashells on the left side of the screen. Today there’s a new menu item – fresh fish, straight from the ocean! These fish aren’t cooked on the campfire spit like the other fish menu item. Instead, they’re kept near the grotto in the upper left corner of the screen. When customers order these fish, click on the fish to throw them on the nearby grill. Once they’re ready, they’ll blink, but make sure you grab them before they burn! Truth always finds a way, even through an ocean of time. Mouse Location: Peeking around the left side of the left tree at the top of the screen. There’s another barbeque item on the menu today – kebabs! Similar to the spit-roasted fish, click on the kebab in the lower right corner to cook it in the nearby fire. Once finished, the kebab will blink. Pick it up to put it on your tray and serve it to the customers before it burns! It’s time for Vittorio to go where his heart belongs… He has a family to reunite. Mouse Location: To the left of the fire pit in the lower right corner of the screen, between the kebabs and the register. The beach is busy as can be, and today will be the ultimate time management test! 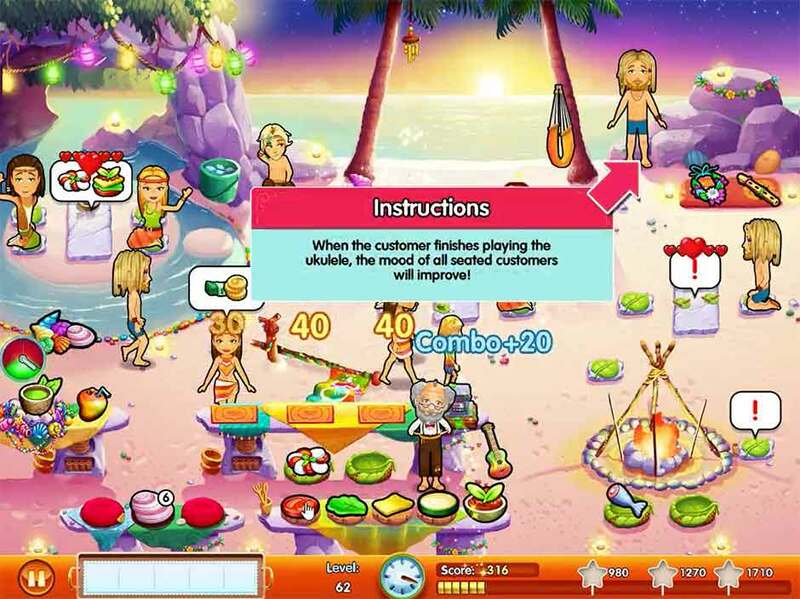 It’s highly recommended you purchase each and every upgrade available for Hippie Island, and whip out the most delicious dishes you’ve unlocked to increase customer tips and patience! Congratulations! 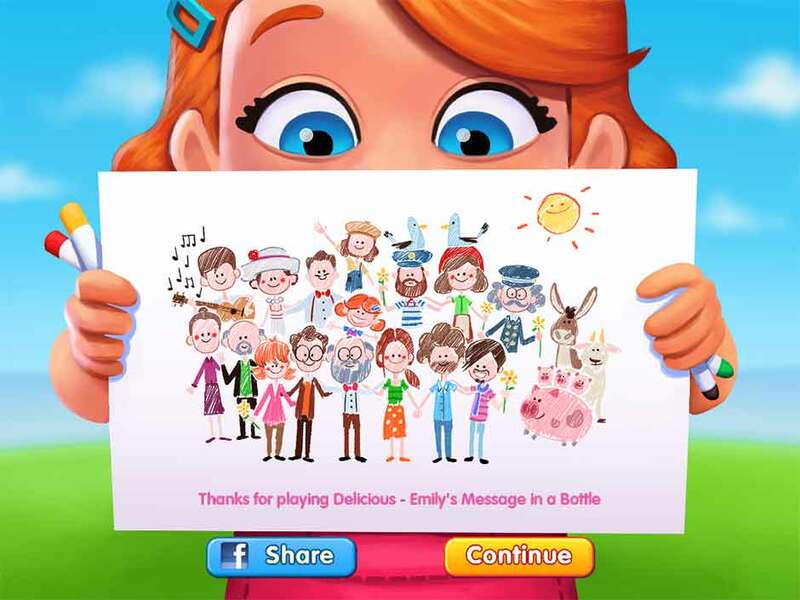 You’ve completed Delicious – Emily’s Message in a Bottle! In addition to the game’s 65 story levels, there are 26 unique challenges awaiting you. Indicated by pink markers along the level select map, challenges will put all your skills to the test with unique goals and objectives. You do not have to play or beat every challenge as you progress, but completing challenges will reward you with diamonds, which can be used to unlock guests and invite people to the big family gathering! This section lists every challenge, as well as strategies on how to complete them. There’s a mouse invasion in the garden! They can’t go to Italy and leave things like this! Ack, they’re everywhere! Mice will pop up all over the restaurant today. You’ll need to catch a total of 25 before the end of the day while keeping customers happy in order to complete today’s challenge. Mice tend to pop up in the same locations as they appear in Levels 6 – 10 of the Mouse Locations section. Impatience is a cook’s worst enemy. Help Emily avoid burning herself when she cooks pizza. Don’t let Emily burn her hands! Pizza will be a popular food item today. Click on the wooden pizza peel hanging next to the oven, then click on a pizza to remove it from the oven without burning Emily’s hands. Serve all of today’s customers without burning Emily’s hands once in order to complete today’s challenge. Tip! Purchase the oven upgrade to prevent pizza from burning while sitting in the oven! This will reduce the rush when cooking and retrieving pizza for customers. Restore the family restaurant to its former glory! Serve only full orders, like in the good old days. Serve full orders only today! To make today’s challenge easier, forget about 2-in-a-row combos and instead focus on serving full orders. A full order means that you bring every single item a customer or table has ordered in one go. Tables with full orders of four require every slot on your serving tray, so there’s no room for error! If you decide to cook pizza early in the oven, but it’s not the type a customer has ordered and you need the spot on your tray for another type, simply pick up the pizza, then click on it while it’s on your tray to remove it. Removing items from your tray does not count against you in today’s challenge. Most importantly, don’t panic! Edward is nearby to help keep customers entertained while you focus on fulfilling orders. Remember – one at a time! The restaurant was neglected in the hands of others. Even the trays are slowly falling apart! Take it steady with a fragile tray! Throughout the course of the day, your tray in the lower left corner will slowly begin to fall apart. One by one, the number of slots will be reduced, until only one remains! Don’t keep items on your tray for later today. Instead, only serve customers as they place orders. Making several trips to fulfill an order is all part of today’s challenge. Utilize Edward’s help to keep customers happy. Jet lag is exhausting! After a few nights of no sleep, will Emily be able to keep up the pace? Emily is very tired today, and as such, she will move much slower than usual. Try to keep Emily’s back-and-forth to a minimum. Cook pizzas only as customers ask for them, and wait by the oven until they’re ready to pick them up. You should also consider picking up desserts all at once and serving them in one go, even if it requires you to split orders between tables. Don’t worry about the flowers, though – Patrick will toss them right to you. What a sweet guy! Edward is also on hand to keep customers entertained in the event it takes Emily longer to move from one location to another. The customers at the fish market seem to be as impatient as Marco. Serve 6 quick orders! Get 6 quick orders today! In order to get a quick order, you will need to have a customer’s order ready almost immediately after a customer has asked for it. A very good way to do this is to keep a grilled fish with lemon or salt and pepper in your inventory at all times. If a nearby counter or table customer orders something pre-cooked off the grill, or pasta, focus on them immediately before any other customer. If you’re quick enough, you’ll receive a quick bonus! It’s best to focus on single customers when trying to complete today’s challenge. While groups are important, getting quick bonuses with them will be highly difficult. 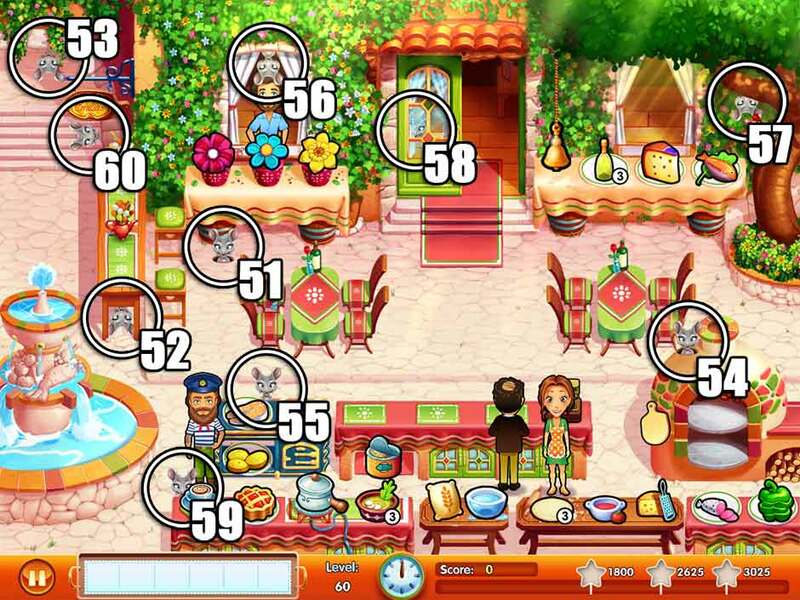 Instead, use the help of Arabella to keep them entertained while you serve the single customers for your quick bonuses! The Italian cuisine is known for its balance and variety: never make the same product twice in a row! Don’t make the same product twice in a row! Today’s challenge can prove very difficult, so it’s a good idea to quietly repeat whatever the last item you made was. Halfway through the day, the game will try to throw you your first double-order curveball. If a customer, or customers, order the same item, click on another item before making the second. You can immediately click on it on your tray in order to remove it. It’s important to do this in order to prevent orders from being made twice. Late in the day, you may have several duplicate orders. In the event this happens, you will either need to make different items in-between, or wait until another customer comes in and orders something different. Bear in mind that grilled fish, lobster, and shrimp are not considered complete items until the lemon or salt and pepper has been added. Don’t spill or burn anything today. As long as you keep your cool, today’s challenge is relatively simple. Only make grilled items to-order. Even if you’re serving another customer on the other end of the restaurant, as long as you click on the grilled items before they burn, Emily will make her way to them, and they won’t burn in the meantime, so long as they’re clicked! The rest is plain and simple. As long as you keep an eye on the grill, you should be able to complete the challenge without a hitch. Challenge 9 – Would You Leave Already? It’s such a beautiful day, customers will need to be kindly ‘invited’ to leave or they will stay all day! You will need to ask sitting customers to leave today in order to clear more room. Pay attention to sitting customers who have ordered their food. Once they’ve ordered, they won’t leave or go to the register until you’ve clicked on them. Customers who are ready to leave will have a “!” pop up over their heads. Click on them to have Emily shoo them off to the cash register. It’s very important to stay on top of this, or other table customers coming into the restaurant may not have a place to sit! Tip! If you have the time, click again on the boat at which table customers are sitting immediately after shooing them off to the register. Edward isn’t around to help clean tables today, so the second “!” bubble indicates the table needs cleaning. If you have time, you can shoo a customer to the register, and preemptively clean a table for incoming customers while minimizing the back-and-forth. 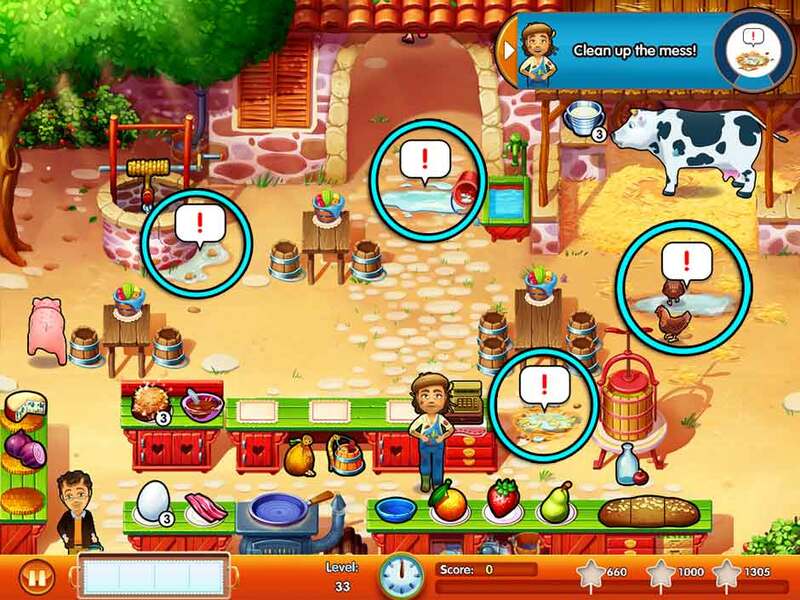 Gino’s farm isn’t exactly the most hygienic. Clean 3 tables in a row two times to put this right! Clean 3 tables in a row two times. The best way to accomplish this is to let table customers come in at will. Once a table customer has finished eating, don’t clean the table! Wait until all 3 tables have been dined at before clicking on all of them and cleaning them right after each other. You will have just enough time to accomplish this twice today, so don’t clean the tables until all three “!” bubbles appear, then clean them back-to-back! Oh, no! Mice invaded the farm and they’re everywhere! Catch all the mice before the end of the day! You will need to catch approximately 25 mice while serving customers in order to complete today’s challenge. Mice tend to show up in the same locations as Levels 31 – 40 in the Mouse Locations section. The only thing that cheers up Gino is watching other customers get angry. Serve 2 angry customers and lift his spirits! Serve 2 angry customers! The simplest way to accomplish today’s goal is to serve customers as per normal – all customers, except those at the well! Customers who go to the well and ask for a bucket should be left alone until they have two hearts and become angry. As soon as this happens, take the bucket to them, help them hoist the water, then check them out right away at the register. Doing it this way will allow you to keep high scores in the restaurant without upsetting other customers. Today is a busy day. Don’t make distinctions and take care of all your customers at the same time! Get 7 combos! Combos can be achieved a variety of ways. The best way to acquire combos is to serve two or more customers back-to-back. This is most easily done with counter customers. Bring full orders to two or more counter customers back-to-back. Checking out multiple customers at once at the cash register also counts toward today’s combo total. After the palaver at the farm, Emily is really tired. Come on, Emily, just one brother left to convince! Emily is very tired, and as such, she’s moving slower than usual. Preparation is the key to today’s success. Keep the deep-fried snacks cooked and the wines stocked by clicking the bell. Try to make single trips to the wine counter, even if it means splitting orders and grabbing all the wine for separate tables or customers at once. Place priority on serving counter customers, utilizing the help of Bianca to keep table customers entertained while Emily keeps up. Vinicio and Bianca are organizing a wine tasting session today. But Vinicio finds that old people don’t tip well! Don’t serve any older people! Old customers are denoted by their fancy white moustaches and luxurious red hats. No matter if these customers are standing at your counter or sitting at one of your tables – ignore them! They will eventually become angry enough they will go away on their own. Focus instead on serving anyone who doesn’t fit the above description. It may look like you won’t be able to meet today’s score goal without serving the old customers, but don’t be fooled! You can completely ignore any and all old customers and still have enough to complete today’s challenge. Challenge 16 – Free Takeaway! Vinicio Jr. has secretly organized a free takeaway day, so only table customers will pay! Only table customers will pay today. As such, your focus should be on serving these customers first and foremost, and keeping them very happy! Use Bianca’s help to keep them in high spirits. You can still serve counter customers, they just shouldn’t be as high of a priority on your list. Tip! Tips and bonuses still count for non-table customers. If you serve them quickly enough, you can still eek out a few extra coins to go toward today’s goal! Challenge 17 – Don’t Leave Just Yet! 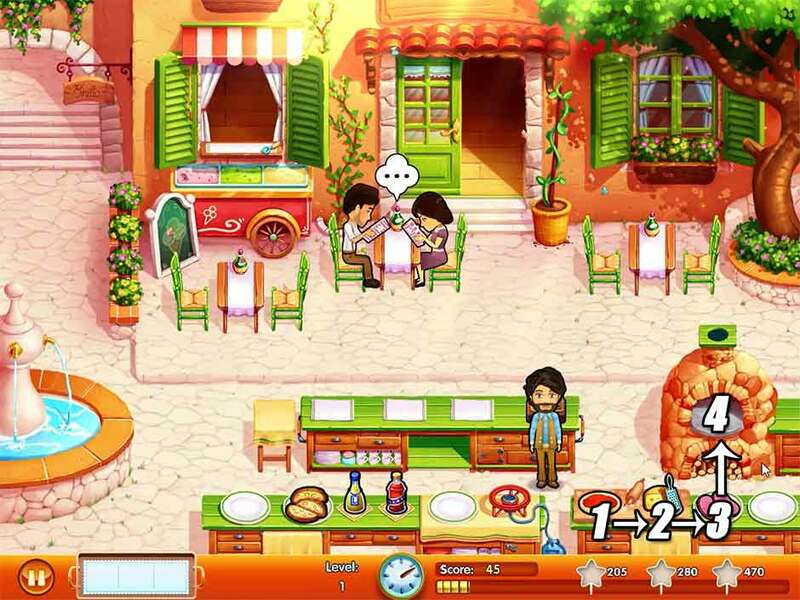 Vinicio thinks Bianca will stay as long as there are customers to entertain – and he has the prove he’s changed! Entertain 6 customers! Only table customers can be entertained. In order to entertain a customer, click on Bianca on the left, then click on the table you’d like her to entertain. Each table you entertain will only be counted once toward today’s goal. The best strategy to take is to have Bianca entertain each and every table that arrives until today’s objective is complete. Get more than 500 coins in tips! In addition to combos and quick bonuses, remember that upgrading your menu and your restaurant can also contribute toward tips! Click on the shopping cart, then select either Store or Menu in order to view upgrades. Select all Menu items you can that improve your tip. Upgrading Store furniture to increase tips is highly recommended. With a highly upgraded restaurant and menu, and some quick service, you should be able to complete today’s challenge a little after the day is halfway done. Emily is worried sick about her parents. Keep her busy so she can put her mind at rest! Don’t stand still for more than 10 seconds! The easiest way to complete today’s challenge is to select the flour station repeatedly, every spare moment that Emily isn’t doing another task. Click on the bag of flour, followed by the bowl of water at the bottom of the screen. Even if you’re stocked completely full of pizza dough, Emily will continue to move back and forth between the items, thus not standing still! Continue this action throughout the entire day when not otherwise preparing food or serving customers in order to easily fulfill the day’s challenge. Challenge 20 – Could You Repeat, Please? Everyone is so worried about Edward and Evelyn, they’re having trouble remembering the orders! Everyone forgets the customers’ orders! Focus on fulfilling customers’ orders as soon as they appear today. Even if you have to split up orders or reduce the number of 2+ customer combos in order to keep track, it’s worth it. After a brief amount of time, a customer’s order bubble will turn into a “?”. In the event you forget a customer’s order, click on the customer to have Emily go to them. If she has an item on her tray, correct or incorrect, the customer’s order will briefly show again. Keep in mind there’s some very simple tricks you can use to prevent yourself from becoming overwhelmed, such as having pizza pre-cooked in the oven and keeping in mind that fish will only ever want fish food as their order. The old restaurant is finally firing on all cylinders again – and a happy customer is a returning customer! Serve 28 ecstatic customers! Bring full orders to customers and serve them quickly in order to increase their chances of being ecstatic. You can also use entertainment to increase their positive mood. Keep combo chains to a minimum in order to focus on making each and every customer as happy as possible. Really, don’t keep them waiting too long! There’s not much room for error today, so serving customers quickly is a must. Tip! There is an upgrade you can purchase in the Store to bring in 1 bonus customer after the day has ended. If you find yourself coming up just short, purchase this upgrade to give yourself the little nudge needed to finish the challenge. Leaves are ecological, but they don’t exactly make the best trays… As Vittorio learns the hard way. Work with a tray that’s slowly falling apart! Throughout the day, the tray on the lower left will slowly decrease in size. Try to focus on bringing customers full orders per customer or per table as quickly as possible. About halfway through the day, you will only have two tray slots left. You may need to make multiple trips to bring full orders to customers. Keep in mind Vito tends to move a little slow, so don’t keep counter customers waiting too long while you fulfill orders with your mini-tray. According to the locals, serving people in the right order is the way to connect one’s spirit with the universe. Serve people in the order they enter the restaurant! Today’s challenge can prove tricky, so it’s important you track people as they enter the restaurant. As they enter, track them visually until they order. Bring them their order right away, then move on to the next customer. Keep in mind table customers take longer to order than counter customers, so a counter customer’s order may appear before a table customer, even though the table customer came first. When in doubt, if a table and counter customer order at roughly the same time, chances are the table customer came in first. Try to keep items stocked to prevent becoming sidetracked during the course of today’s challenge, including keeping a barbequed ham or fish on your tray. Recruiting Parsley’s help via the Store to clean tables is essential in focusing on today’s goal. Vittorio has to finish his Yoga session. He’ll need some quiet time to get his Zen Moment. Don’t serve anyone for a while! Vittorio needs to meditate. The flow of customers today is pretty high, however, so doing this early in the day isn’t such a good idea, since it can leave you playing catch-up. Instead, only focus on today’s goal once your restaurant has closed and you’re dealing with the last customer. Before checking them out, be completely still and don’t click on anything, so that Vito can meditate! Your last customer may leave angry, but done correctly, you should still be able to comfortably complete today’s challenge. The island volcano is acting up again. Deliver products before the next shake, or they will fall from Vito’s tray! Deliver the products before they fall from the tray! Every so-often, the local volcano will rumble, causing Vittorio to drop one of the items on his tray. There’s a very easy way to manage this. While the rumbling may happen without warning, you can always count on the fact that the first item on the tray will be the one that falls off. In order to prevent orders from becoming jumbled and customers from becoming impatient, try clicking on a placeholder item a customer didn’t order to put on your tray. Whenever the volcano rumbles, quickly serve all the remaining items on your tray, then pick up another! This way, you can minimize the disruption caused by the local volcano while you cruise your way toward completing today’s challenge. On this beach, everybody is very green, so wasting food will earn Vittorio some angry looks! Don’t remove or waste any products! This includes wrong orders, overflowing drinks, and any cooked items being burnt. Pay close attention to fruit or sandwich orders especially, since the layers on these can be easy to mix up. Keep in mind that even if you’re on the other end of the beach, clicking on a cooking item before it burns will prevent it from burning, no matter how long it takes Vittorio to make his way back over. If necessary, place a lower priority on customers who want to use the hammock in order to stay on top of today’s flawless service. Tip! You can purchase an upgrade in the Shop that will prevent your drinks from overflowing, as well as an upgrade to lengthen the amount of time it takes before cooked items will burn. There are sixty-five mice hidden throughout the game’s sixty-five story levels. Finding them all will reward you with the Mice Catcher Potion trophy. However, locating these sneaky rodents can prove difficult sometimes. This section of our walkthrough reveals every hiding spot of every single mouse in the game. Scroll down to get started, or click on a Mouse Location in the walkthrough above to get started! Level 1: On the cobblestones, just below the right chair of the leftmost table. Level 2: Hanging down from the top of the open window on the left. Level 3: Behind the upper left portion of the pizza oven. Level 4: Behind the upper left portion of the customer counter, near the tea table. Level 5: Peeking out from behind the rock beneath the tree in the upper right corner of the screen. Level 6: To the right of the flower vase sitting next to the cash register. Level 7: Behind the fence in the upper left corner, to the left of the balloon archway. Level 8: Behind the top of the covering above the ice cream and smoothie stand. Level 9: To the left of the tree in the upper right corner. Level 10: In the upper left corner of Paige’s canvas, in the lower left corner below the suitcase. Level 11: In the canvas bag at the foot of the steps in front of the restaurant doors, where the tomato vine is. Level 12: Below the “Emilia’s” sign in the upper left corner of the screen. Level 13: Popping out of the window box full of flowers in front of the left window. Level 14: In the lower right corner, in front of the pizza oven. Level 15: In the tree in the upper right corner, next to the bird’s nest. Level 16: Behind the back of the fountain in the lower left corner the screen. Level 17: Behind the top of the singles table, to the right of the fountain in the lower left corner. Level 18: Peeking around the right side of the counter, next to the cash register. 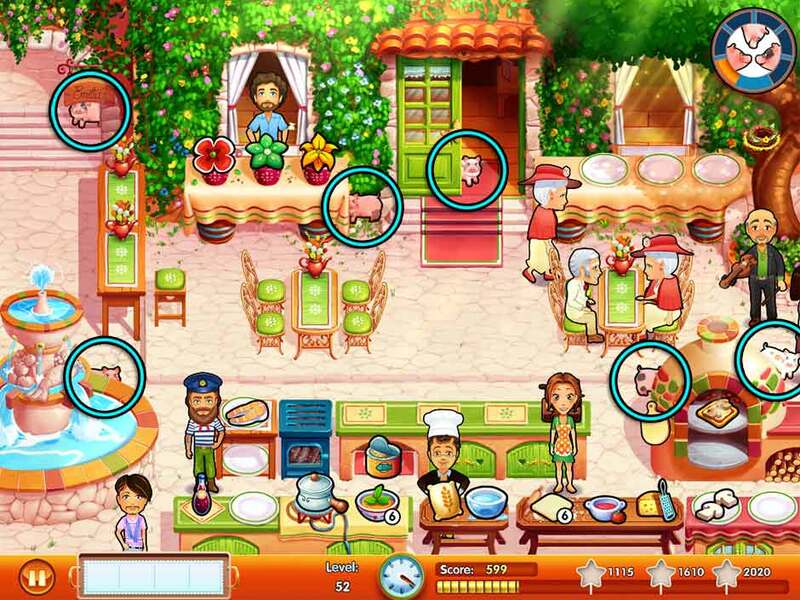 Level 19: Peeking around the upper left side of the pizza oven. 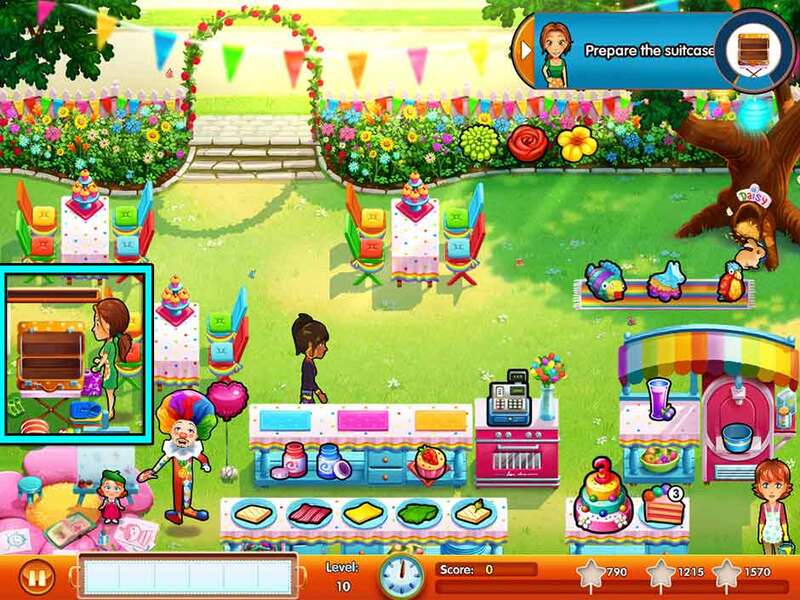 Level 20: In the lower portion of the fountain in the lower left corner of the screen. 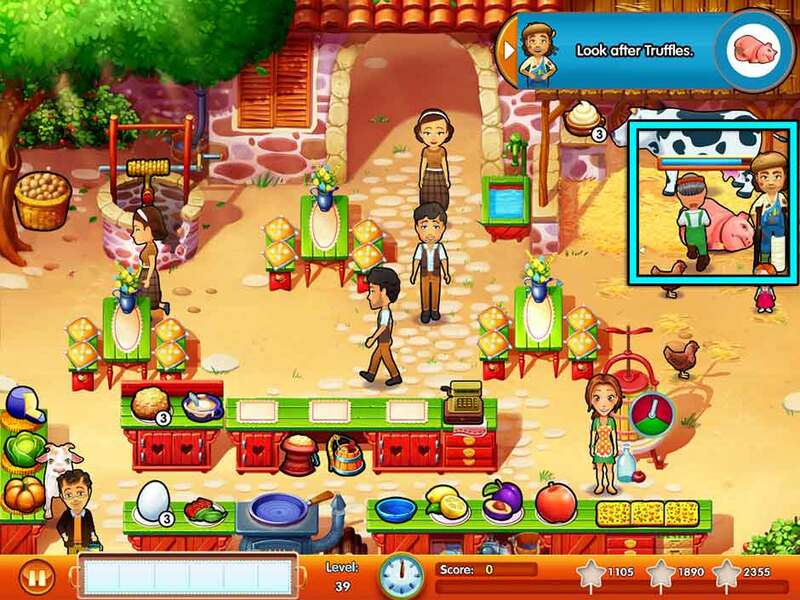 Level 21: To the immediate left of the basket on the far right side of the screen, where the customers enter. 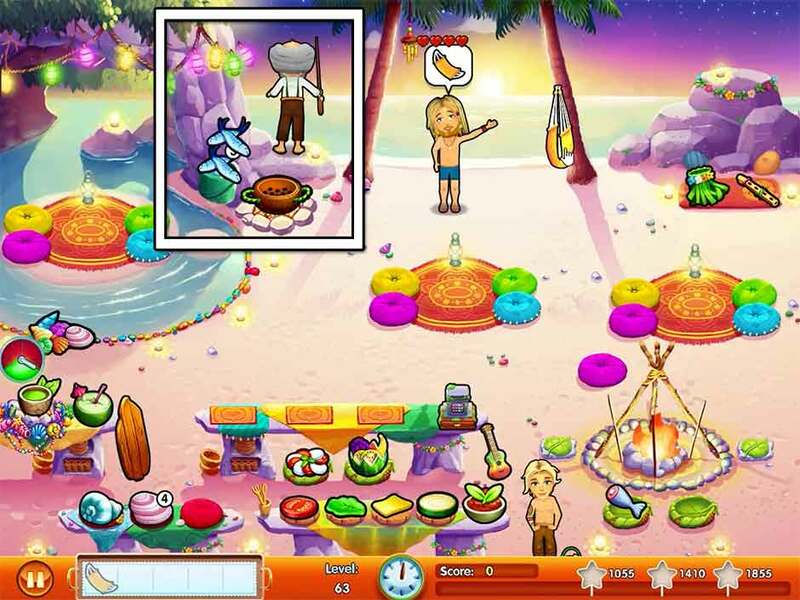 Level 22: At the top left corner of the ice chest which holds fish in the middle of the restaurant. Level 23: Hanging down from the center of the overhang roof in the upper left corner. Level 24: Peeking around the upper left corner of the upper left docked boat. Level 25: Hanging down from the bottom of the wood portion of roofing in the upper left corner. Level 26: Behind the upper right portion of the grill, between the mussels and the chowder pot. Level 27: Behind the basket of ice in the upper left corner, near the fishing supplies. Level 28: Behind the red pile of netting at the center top of the screen. Level 29: Peeking behind the upper right corner of the rightmost docked boat. 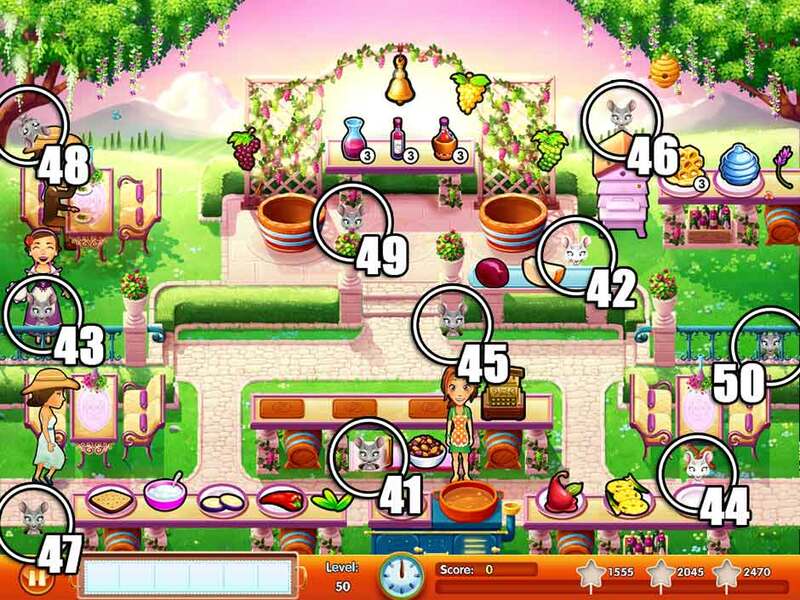 Level 30: Between the checkout counter and the ice bed holding the grill items, in the lower left corner of the screen. Level 31: Peeking around the left side of the well. 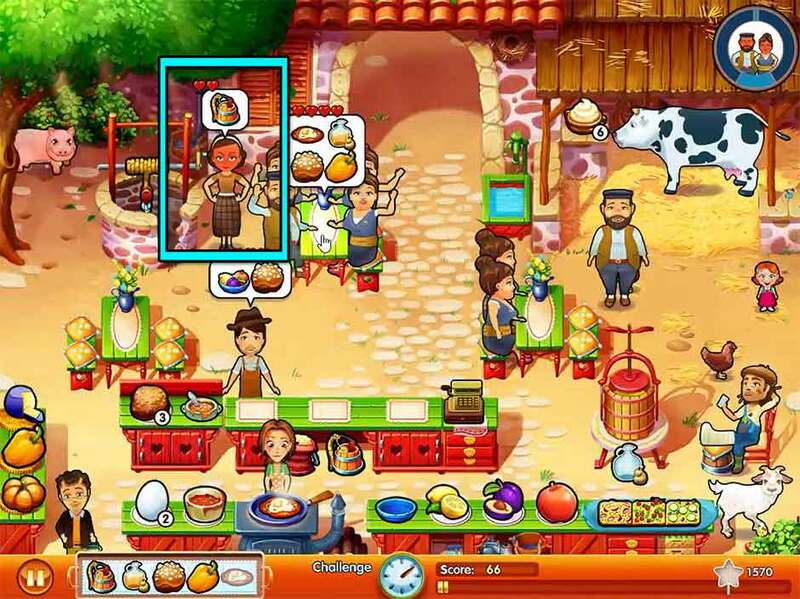 Level 32: To the right of the cow in the upper right corner of the screen. Level 33: In the upper left corner of the entrance archway at the top of the screen. Level 34: Peeking out of the hole in the tree in the upper left corner of the screen. Level 35: Behind the upper right corner of the truffle counter, to the left of the customer checkout counter. Level 36: On top of the wood overhang above the stable in the upper right corner of the screen, above the milk pail. Level 37: Behind the upper right corner of the cider churn. 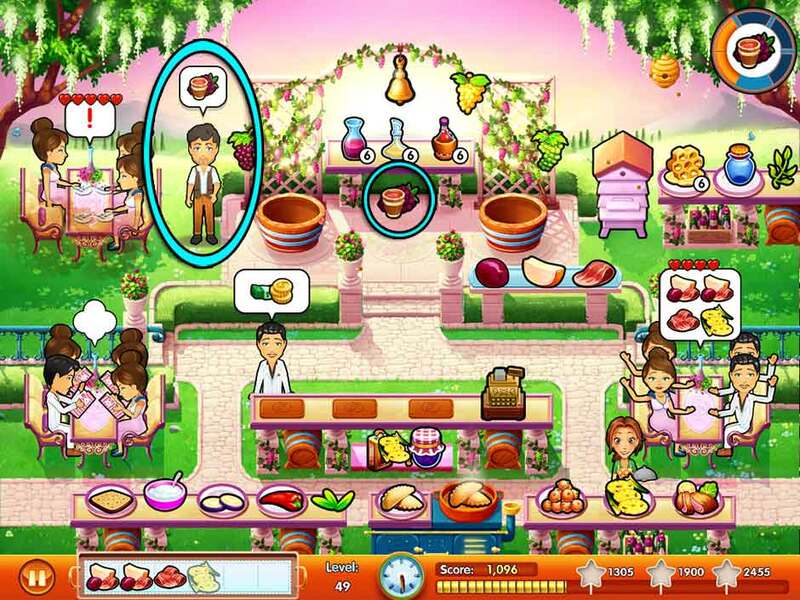 Level 38: At the foot of the tree in the upper left corner, in front of the truffle basket. 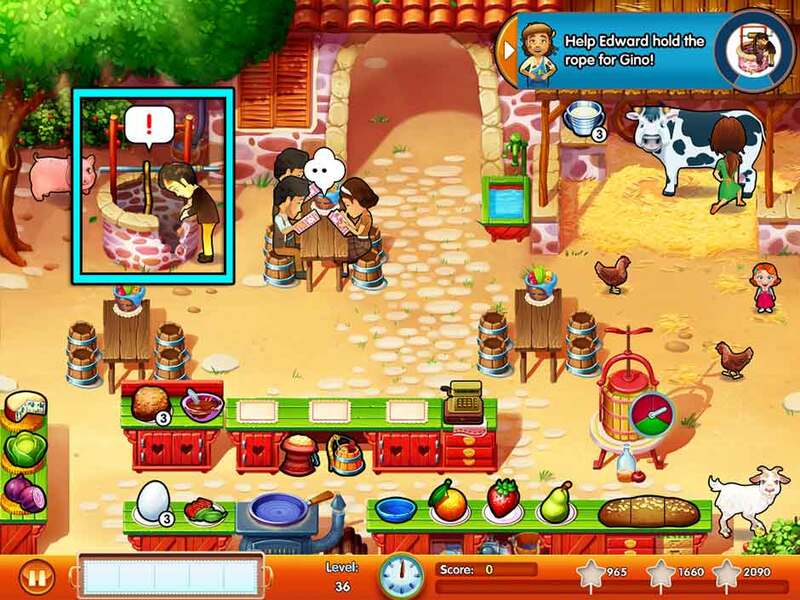 Level 39: Beneath the cow’s head, in the upper right corner of the screen. Level 40: At the bottom of the screen, between the stove and the fruit bowl. Level 41: Below the checkout counter, on top of the blanket. Level 42: Behind the right side of the olive and cheese counter, toward the upper right corner of the screen. Level 43: On top of the railing on the left, in front of Bianca the entertainer. Level 44: Behind the right side of the snack counter, above the last plate on the right in the lower right corner of the screen. Level 45: Below the rightmost central column holding the pot of flowers, to the lower left of the olives. Level 46: At the top of the beehive box in the upper right corner of the screen. Level 47: In the bottom left corner, to the left of the sandwich counter. Level 48: Hanging down from the branch in the upper left corner of the screen. Level 49: Above the flowers on the leftmost center column, below the wine table. Level 50: Between the rightmost rails on the right side of the screen. Level 51: Below the left side of the flower table, in front of the barrel. Level 52: Underneath the leftmost table legs, next to the fountain on the left. 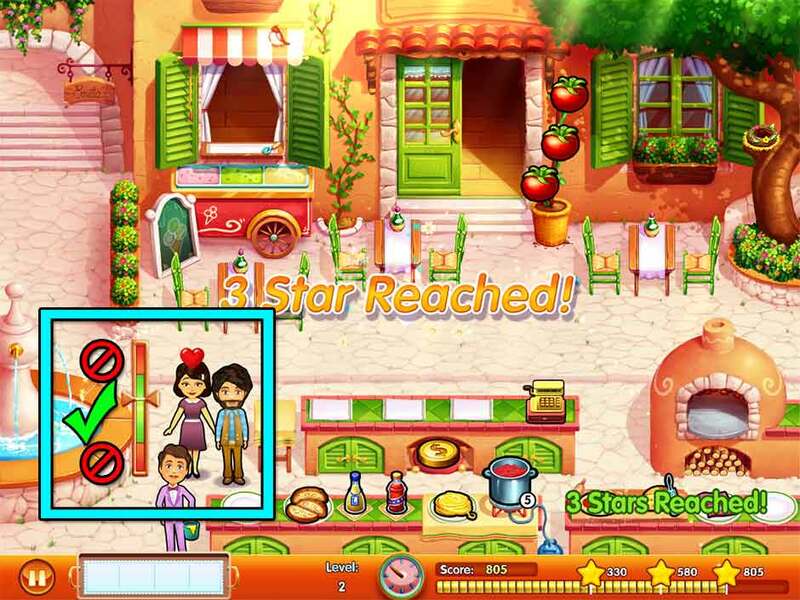 Level 53: Hanging down from the archway in the upper left corner of the screen, next to the “Emilia’s” sign. Level 54: On top of the left side of the pizza oven. Level 55: Behind the top of the fish grill. Level 56: Hanging down from the left window where Patrick is standing. Level 57: Hanging down from the tree branch in the upper right corner of the screen, above the bird’s nest. Level 58: In the glass window of the restaurant door – the left center pane specifically. Level 59: In the lower left corner, below Marco and near the fountain. Level 60: Just below the “Emilia’s” sign in the upper left corner. Level 61: At the top left side of the pile of boulders in the upper right corner of the screen. 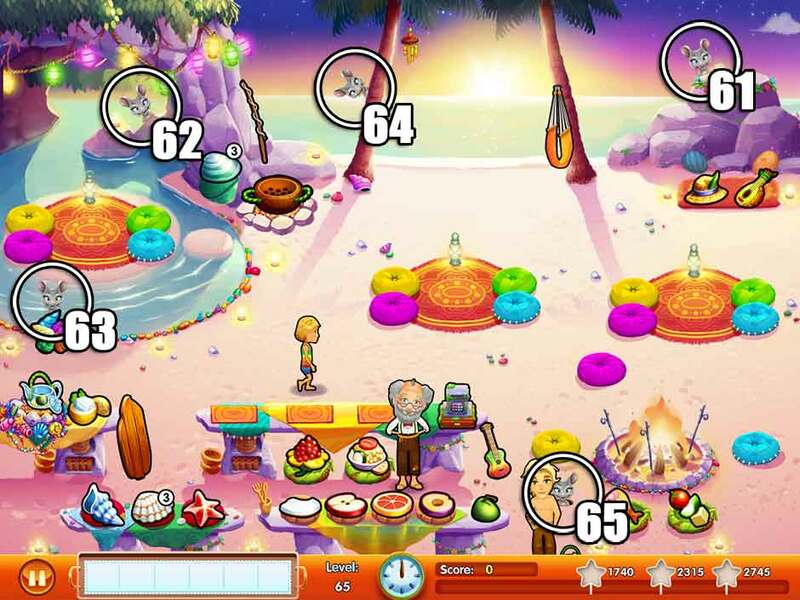 Level 62: In the grove in the upper left corner of the screen, below the string of lights and to the right of the candle on the rock. Level 63: Behind the pile of seashells on the left side of the screen. Level 64: Peeking around the left side of the left tree at the top of the screen. 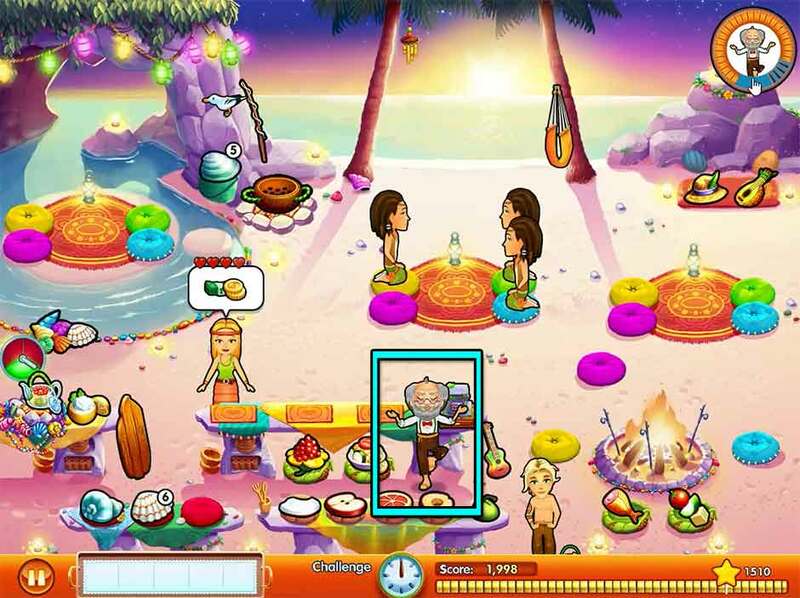 Level 65: To the left of the fire pit in the lower right corner of the screen, between the kebabs and the register. There’s nothing sweeter than a family memory. Fourteen memorable moments take place during the game’s cutscenes. This section reveals the location of each and every one, ensuring no memorable moment is left undocumented. 7 Paige’s 3rd Birthday Party! 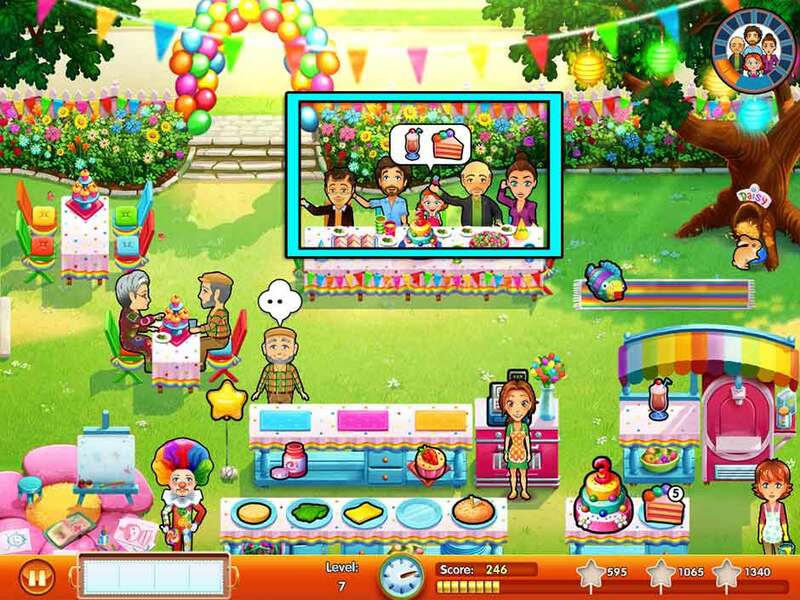 At the start of level 7, Paige and her family will sit together at a large table to celebrate her birthday. 9 Our little artist! At the start of level 9, Paige will cheer up her grandpa with a drawing. 11 Back in Napoli At the end of level 11, the family takes in their first impression of Napoli. 13 Fishies At the end of level 13, Paige talks with a local friendly fisherman. 17 An unusual pony At the end of level 17, Paige returns with an unexpected guest. 21 Seagull entertainment At the start of level 21, Arabella shows off her talented seagulls. 27 Fishing big At the start of level 27, Edward and Marco land a big catch. 31 Tug of war At the end of level 31, Paige and Truffles become fast friends. 40 Three little pigs At the start of level 40, three new members are welcomed to the family. 46 Making good wine again At the end of level 46, Vinicio remembers why he started his business. 49 A new wine recipe At the end of level 49, Edward and Paige playfully discuss a new wine recipe. 53 Catching up At the start of level 53, the five brothers reflect on past experiences. 56 Going back home At the end of level 56, Edward finds his way back home. 60 The family reunion At the end of level 60, the family gathers for the reunion. 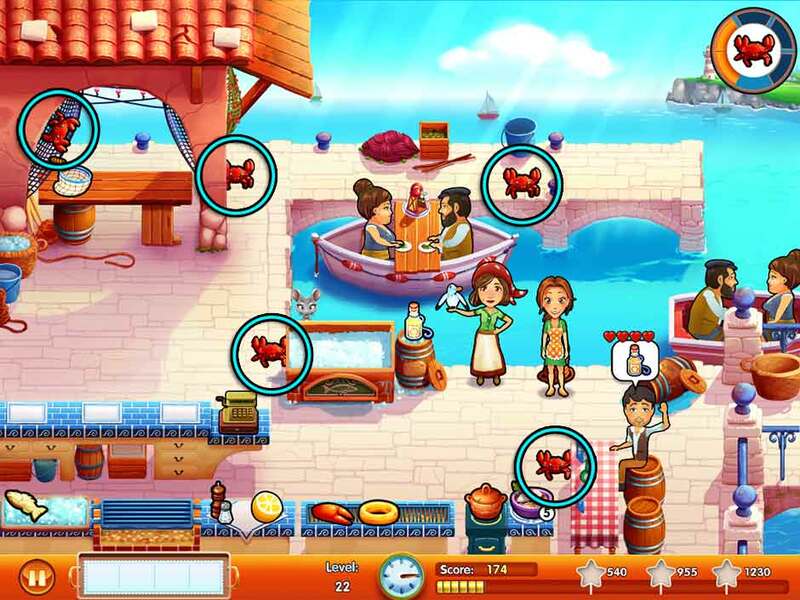 There are 14 unique trophies to unlock in Delicious – Emily’s Message in a Bottle. This section lists all trophies, what they are, and how you can earn them. Not sure where the trophies are? Click on the trophy icon in the upper right corner of the level select screen to get started! Timeless Napoli Spirits Finish the Emilia’s Place restaurant. Complete levels 1 – 5. Birthday Soda Treat Finish the Emily’s Garden restaurant. Complete levels 6 – 10. Lost Memories Drop Finish the Old Family restaurant. Complete levels 11 – 20. Sea Moonshine Finish Marco’s Fish Market. Complete levels 21 – 30. Liquor of the Countryside Finish Gino’s Farm. Complete levels 31 – 40. Bittersweet Grape Juice Finish Vinicio’s Vineyard. Complete levels 41 – 50. Family Surprise Fizz Finish the new Napoli Family Restaurant. Complete levels 51 – 60. Happy Hippie Shake Finish Hippie Island. Complete levels 61 – 65. Love Elixir Collect all memorable moments. Click on the camera icon that appears when a glistening circle appears during cutscenes. For a complete list of memorable moments, see the Memorable Photo Moments section of this walkthrough. Mice Catcher Potion Find all mice in the game. A mouse is hidden in each level of the game, excluding challenges. For a complete list of mouse locations, see the Mouse Locations section of this walkthrough. Stardust Tonic Achieve 3 stars for each day. Earn 3 stars during each level, excluding challenges. For help with specific days, see our in-depth level explanations in the walkthrough above. For a visual guide, see the Video Walkthrough section below! Diamond Digger Brew Use all diamonds to unlock every family character. Earn diamonds by completing objectives during levels, or by completing challenges. There are 91 available diamonds for you to earn. You will need 90 diamonds to unlock all family characters. Click on the diamond icon in the upper right corner of the level select screen to unlock family characters using diamonds. Shopper Shot Buy every product from every store. Click on a level, then select the shopping cart icon to be taken to the Store (if not selected, click on “Store” at the bottom of the screen). Click on an item with a price tag to view details and/or purchase it. Each restaurant has a number of upgrades available for purchase. Playing through the entire game once won’t yield quite enough money for you to purchase all upgrades. Play levels again by selecting them. Only numbered levels, not challenges, will reward you with money upon completion. Purchase all products across all restaurants to unlock this trophy. The Chooser’s Champagne Unlock all the menu upgrades across all chapters. Click on a level, then select the shopping cart icon to be taken to the Menu (if not selected, click on “Menu” at the bottom of the screen). Click on a menu item to view all available information. If a menu item is still locked, a lock icon will appear over it. Click on the menu item to view the requirements needed to unlock it, e.g. how many more customers you need to serve. Unlock all items across all restaurants to earn this trophy. Welcome to the Delicious – Emily’s Message in a Bottle Video Walkthrough! Whether you’re a visual person, or just need a little nudge in the right direction, our video walkthrough features the entire game – start to finish – 100%! Get 3 star scores on all levels and breeze through challenges by using our video walkthrough as your guide. Click the Play button below to get started, or click on the drop-down options menu in the upper left corner to select a different level! 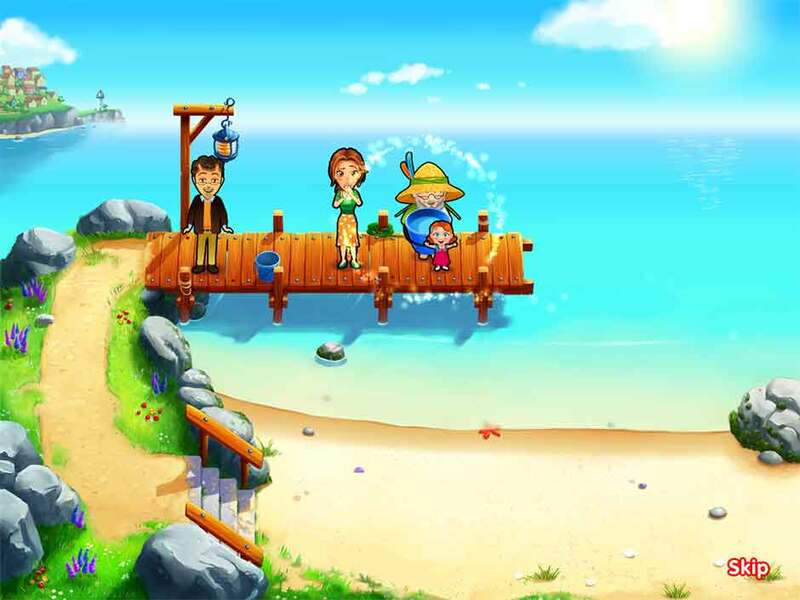 The Delicious – Emily’s Message in a Bottle Official Walkthrough is meant as a guide and does not contain cheats, hacks, or serials.